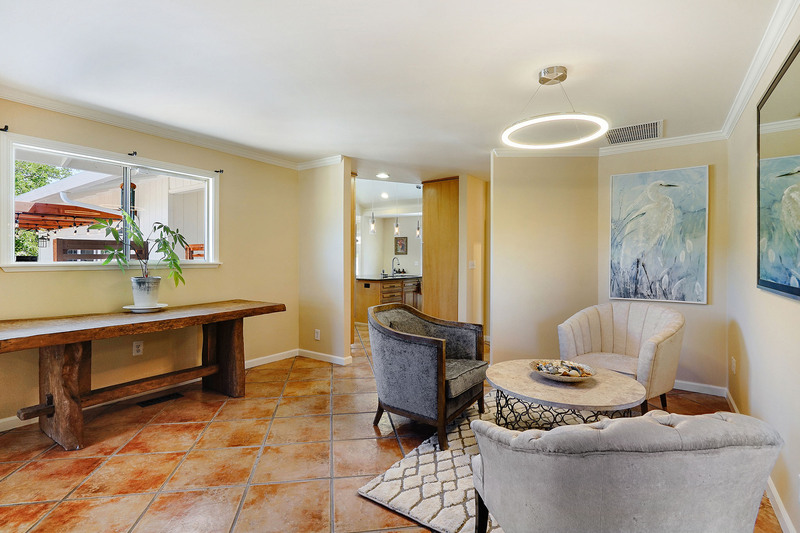 Single story home, 3 bedroom, 2 bath, approx 1,933 sqft +/-, tastefully updated with many upgrades and luxurious amenities throughout. 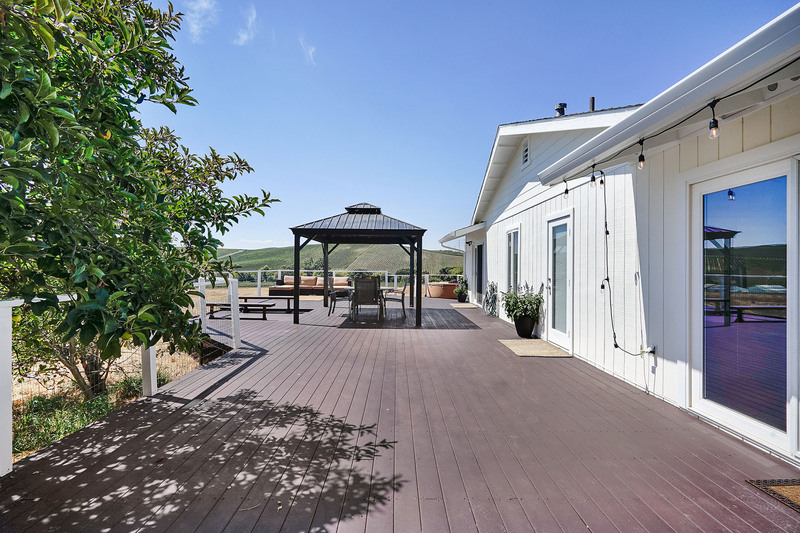 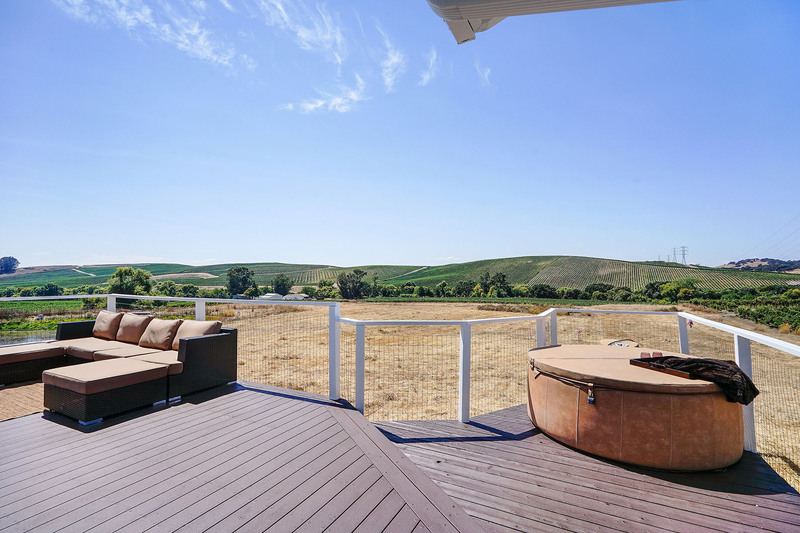 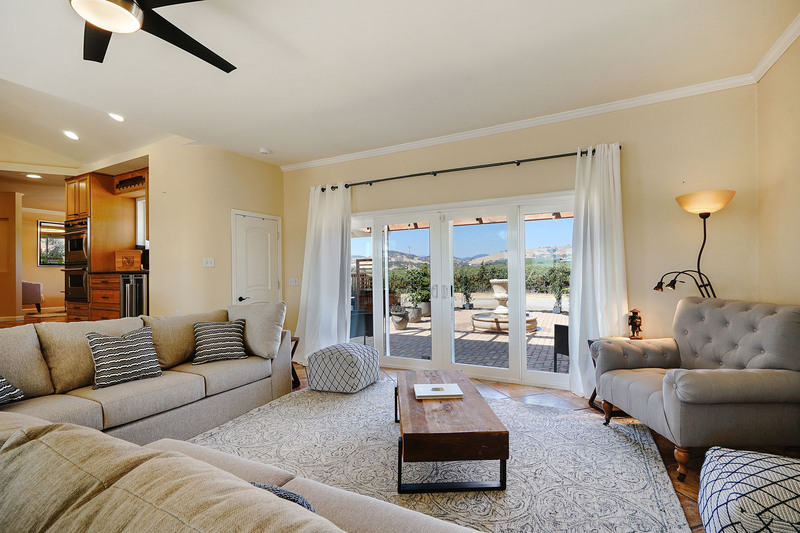 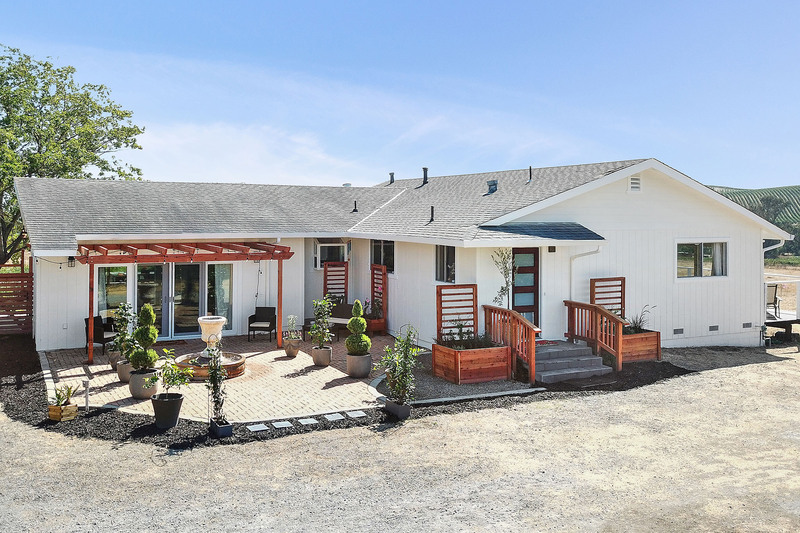 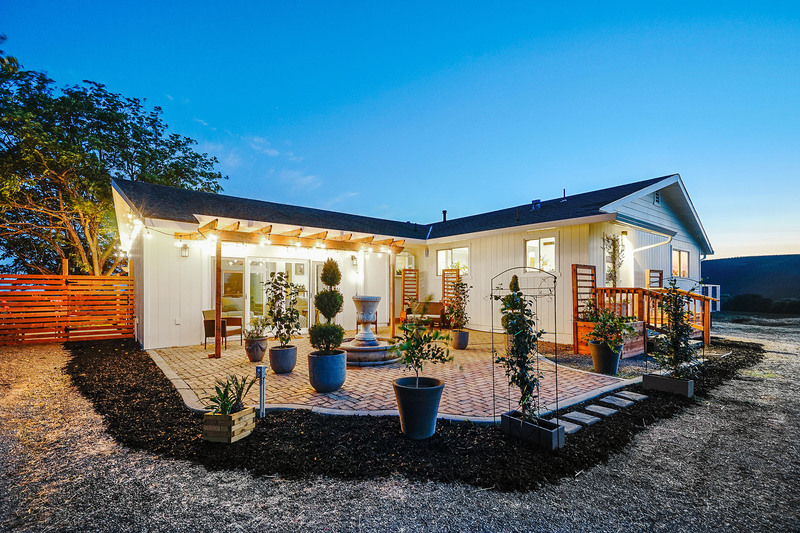 Situated on 10 acres with breathtaking 360 degrees views of rolling hills, surrounding vineyards of Napa that stretch all the way to the San Pablo bay. 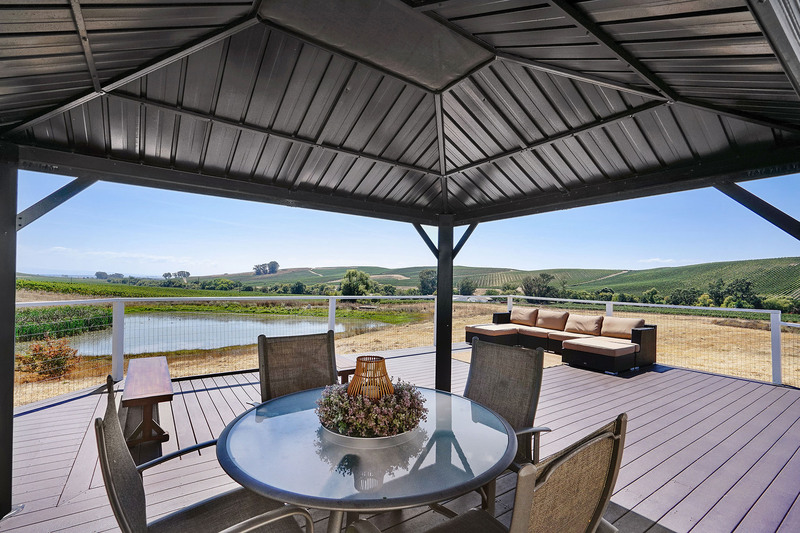 This tranquil setting offers hiking trails that wrap around to view all off the natural beauty. 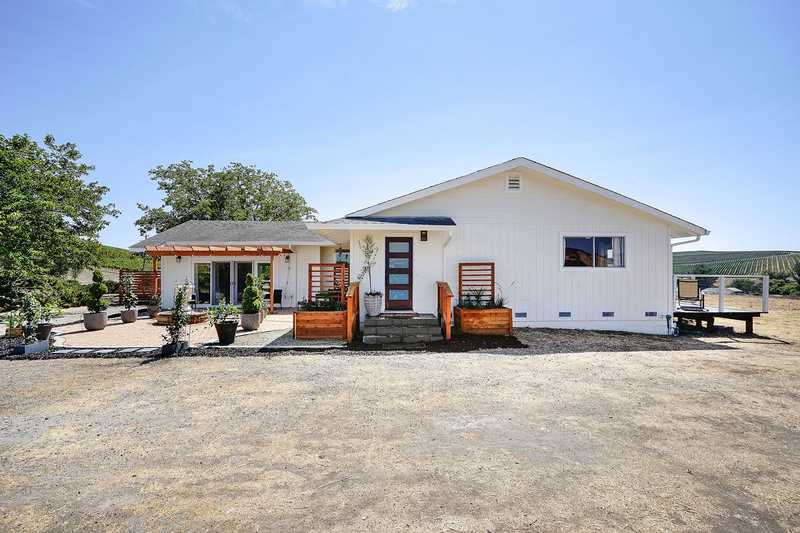 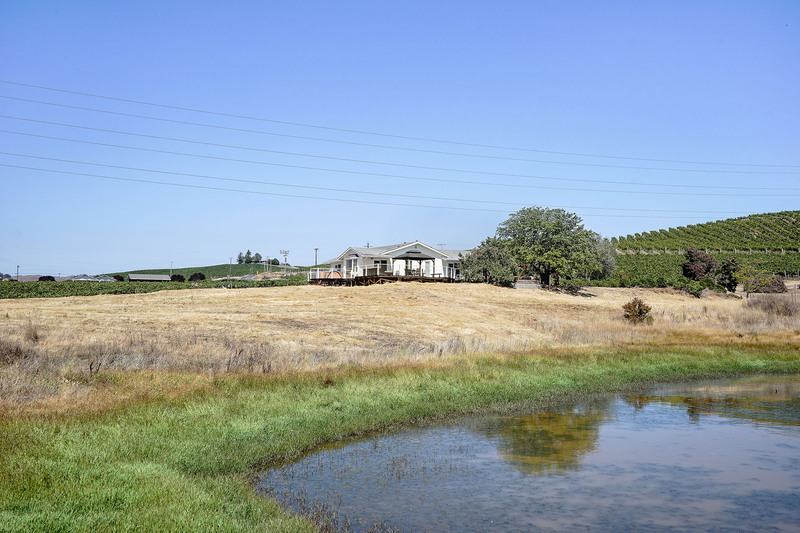 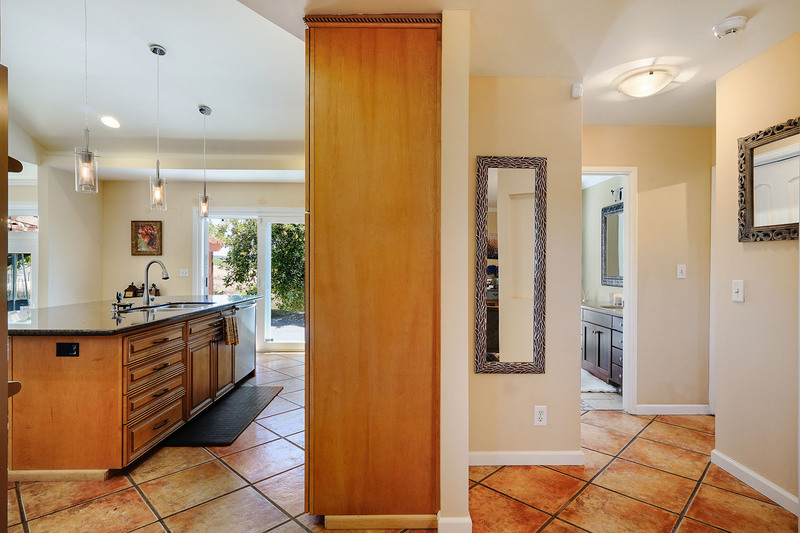 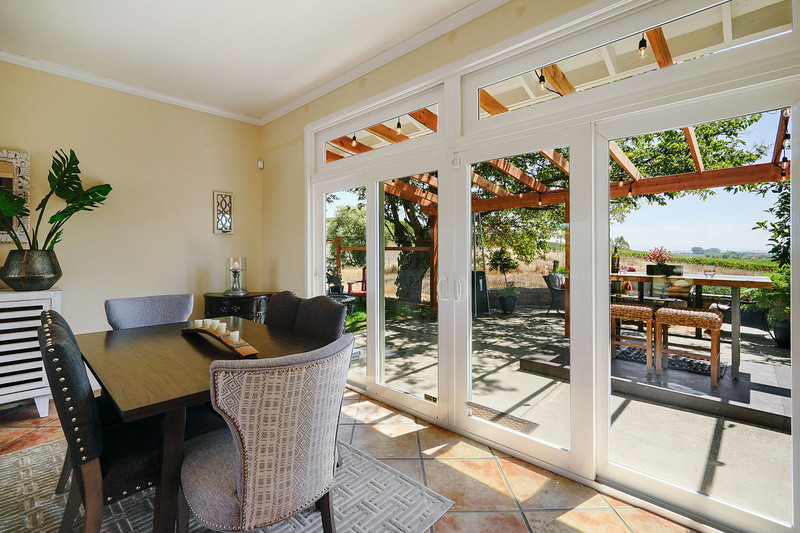 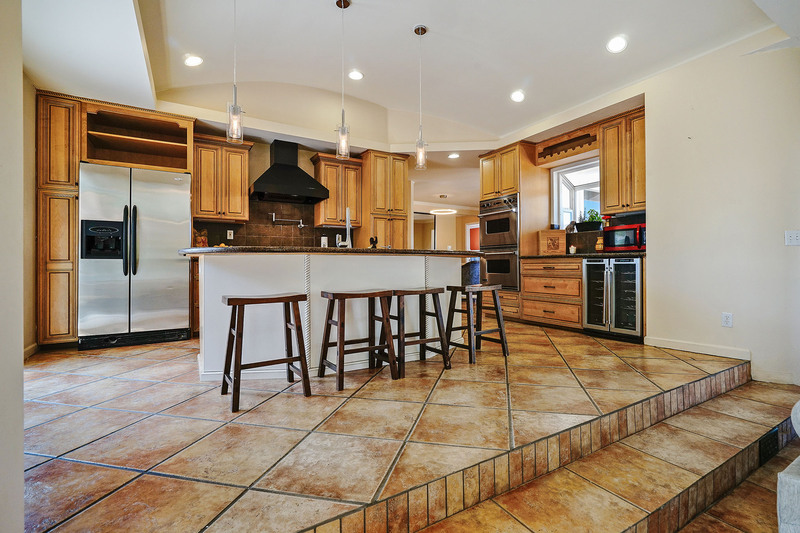 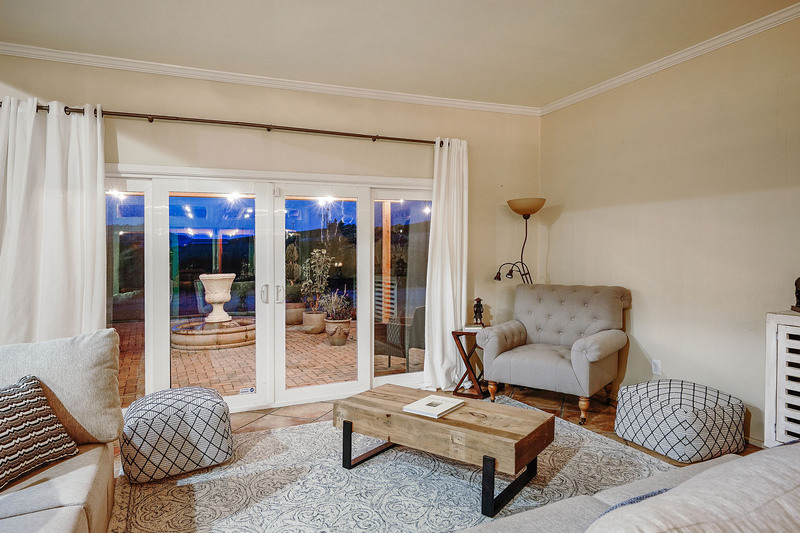 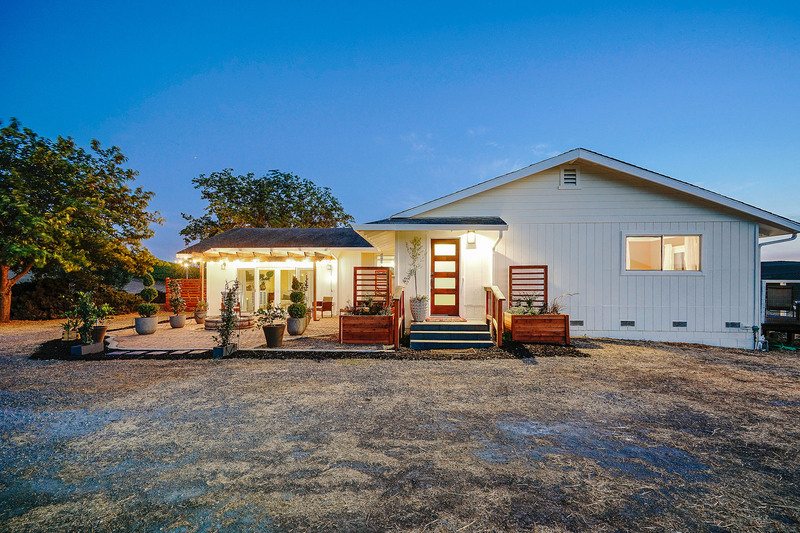 The property is zoned AW with many possibilities that are subject to Napa County approval; such as a secondary dwelling, potential Winery site with approximately 7.78 acres of vineyard potential with permitted stock pond water rights, room for a pool, horses, and much more! 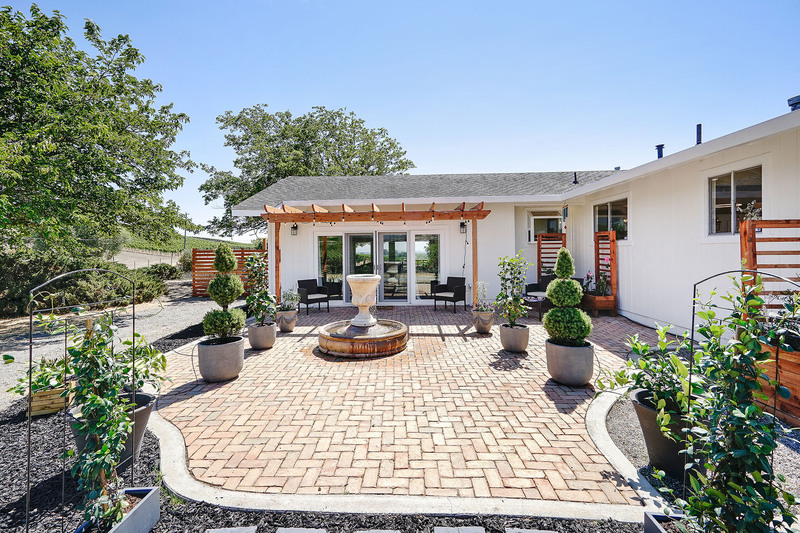 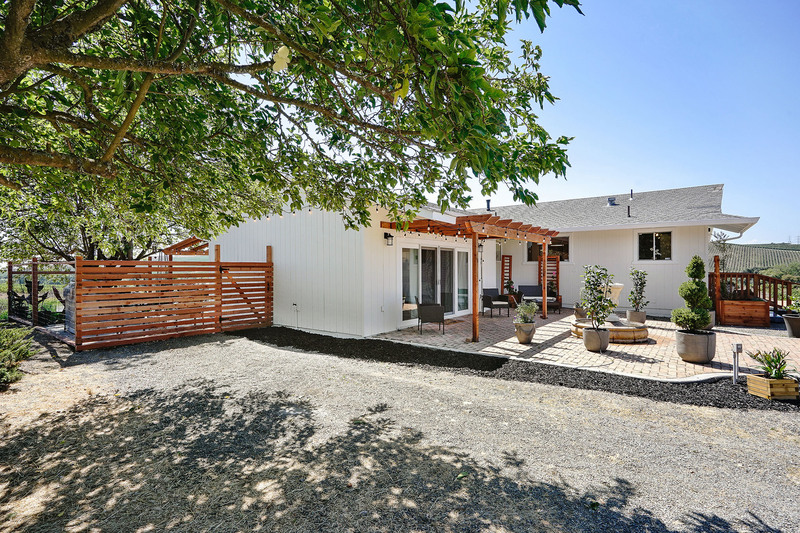 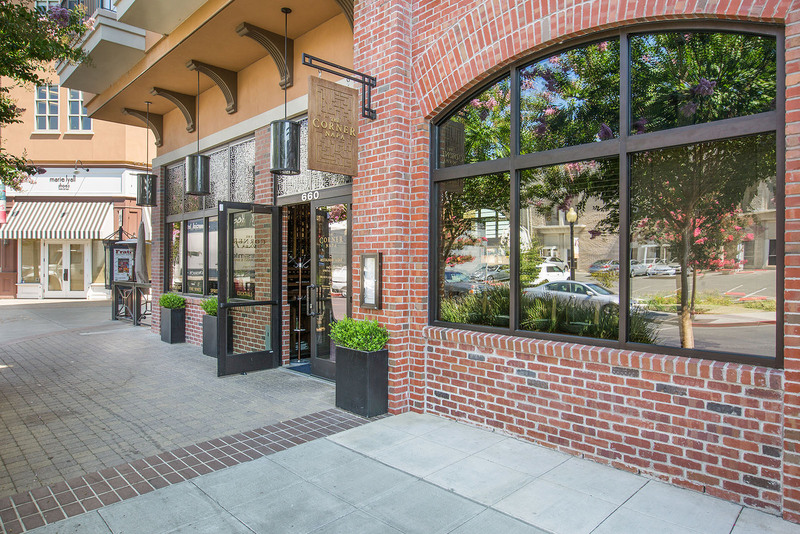 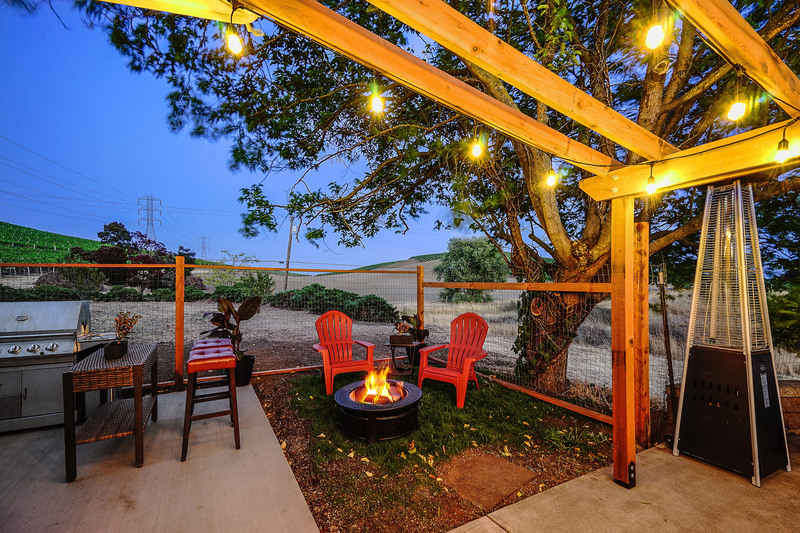 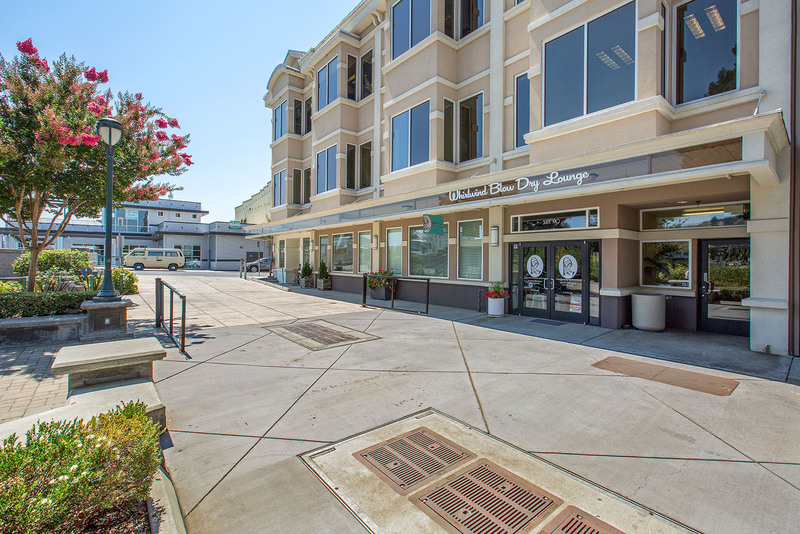 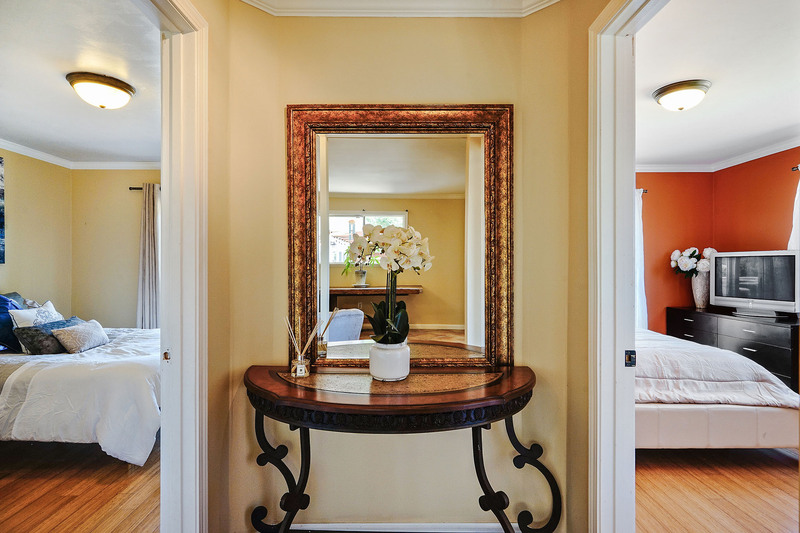 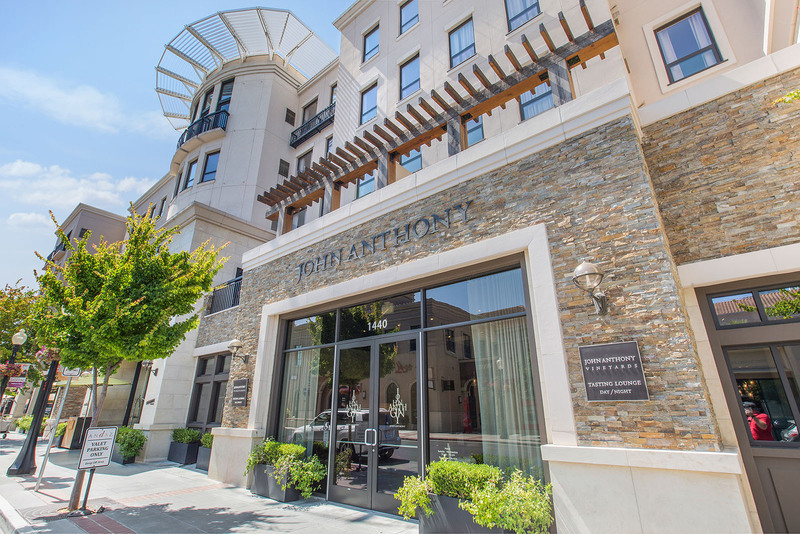 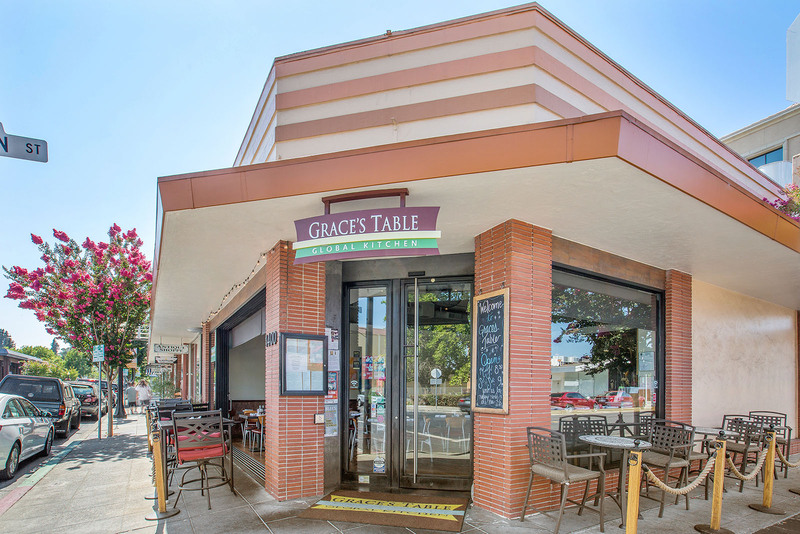 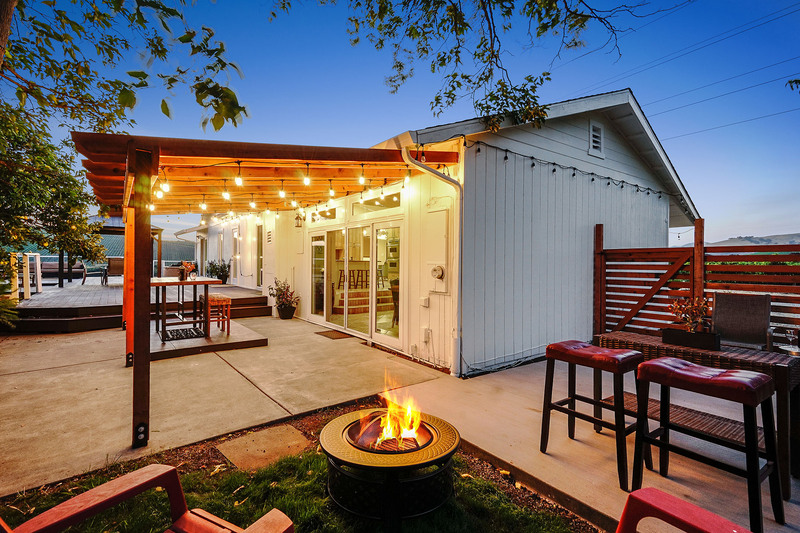 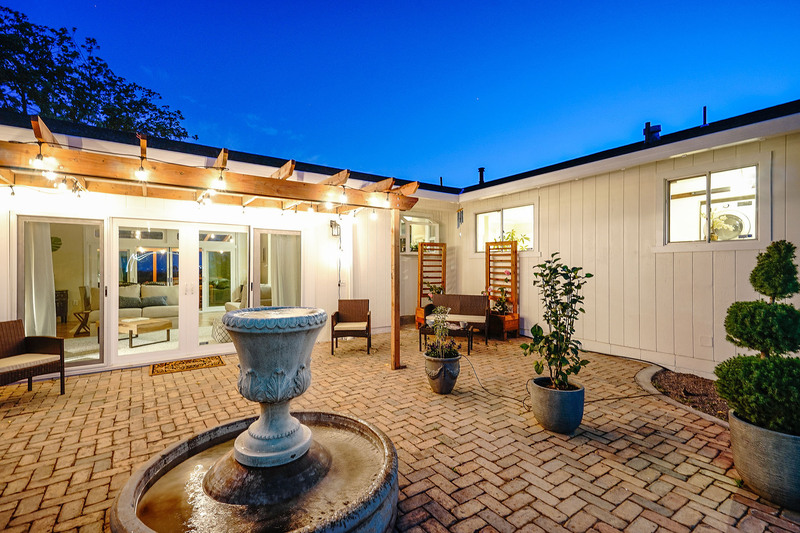 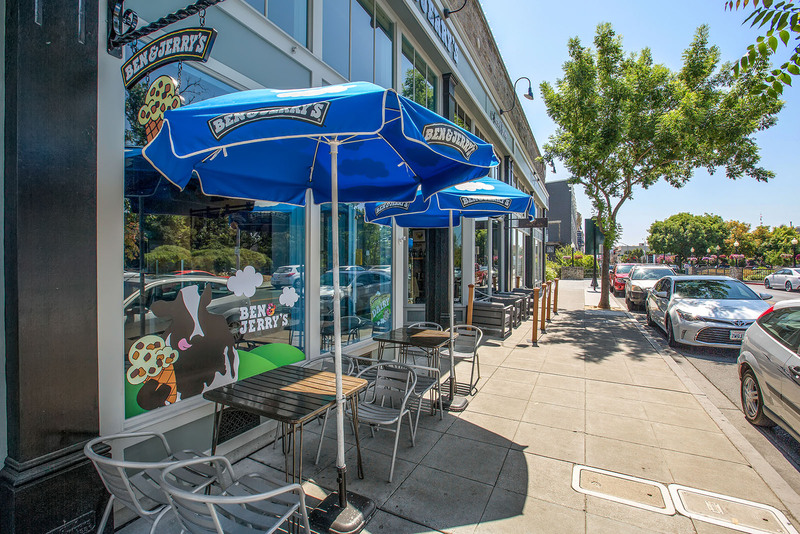 Conveniently located 15 minutes between both the downtown of Napa or Sonoma, and approximately 1 hour from San Francisco. 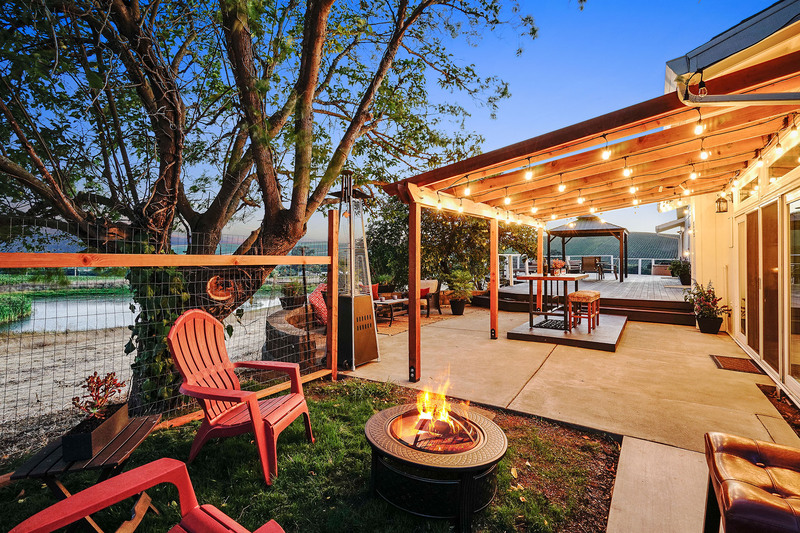 Perfect escape after a long work day or as a weekend getaway for your 2nd home. 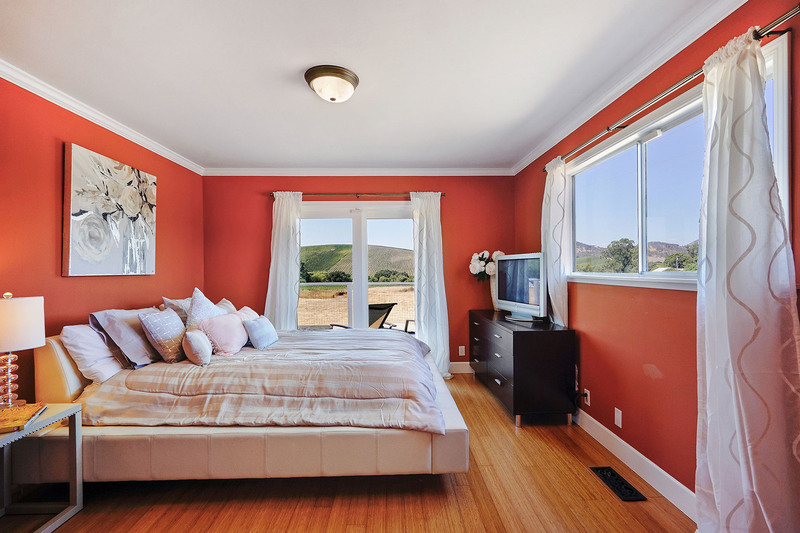 Great location, enjoy gardening, hiking, bicycling, wine tasting, shopping and many local activities. 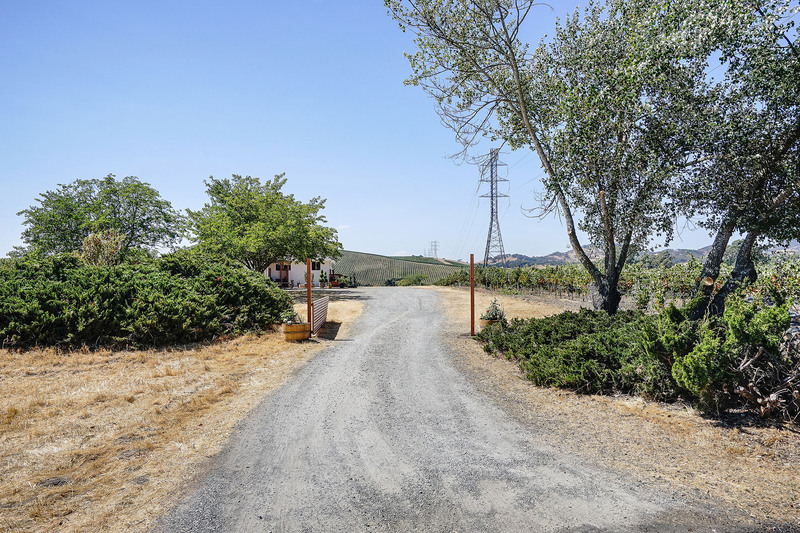 Located near the Domaine Carneros winery, just follow the gentle curve of the road a short distance. 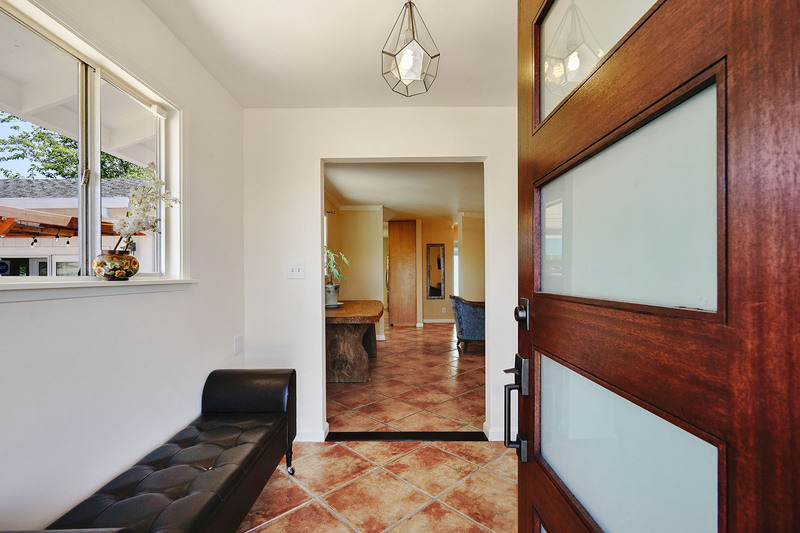 Enter your private driveway with gated entry. 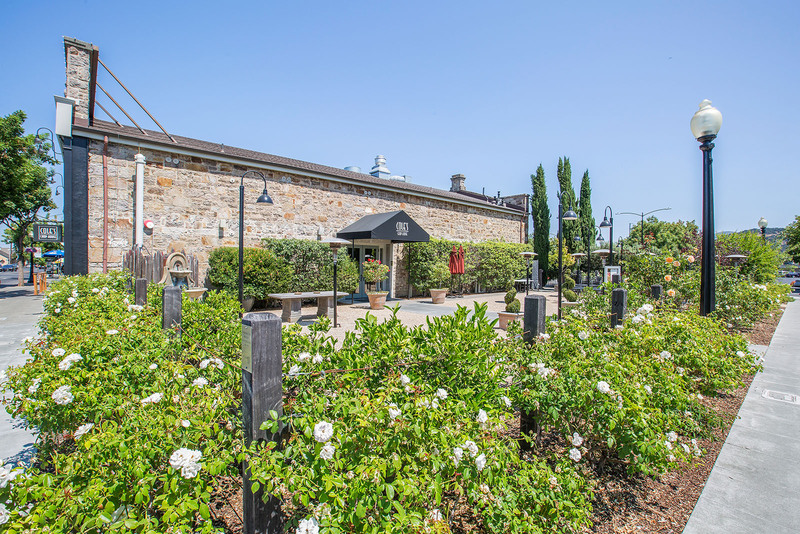 There is ample parking of up to 10 cars+ available, with options to construct a garage or workshop. 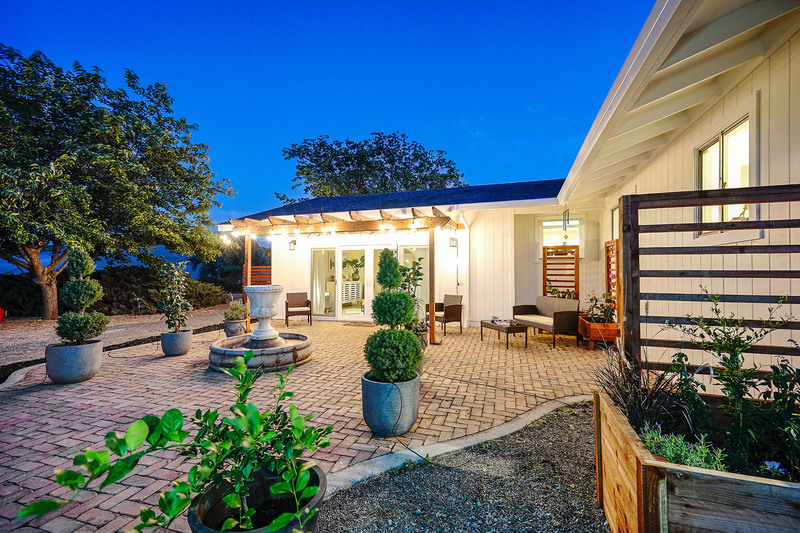 The front of the home has a Mediterranean inspired, with a rustic brick with herring bone pattern courtyard and a fountain in the center that is bordered by potted plants. 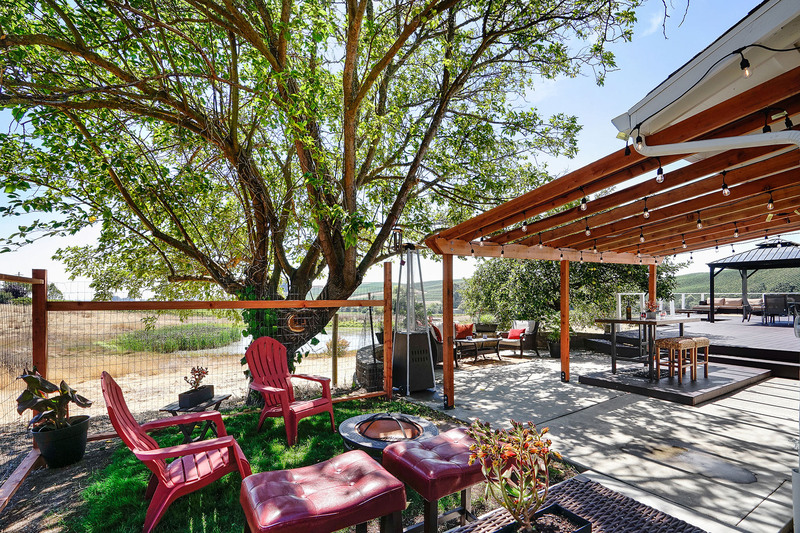 Enjoy a morning cup of coffee under the pergola. 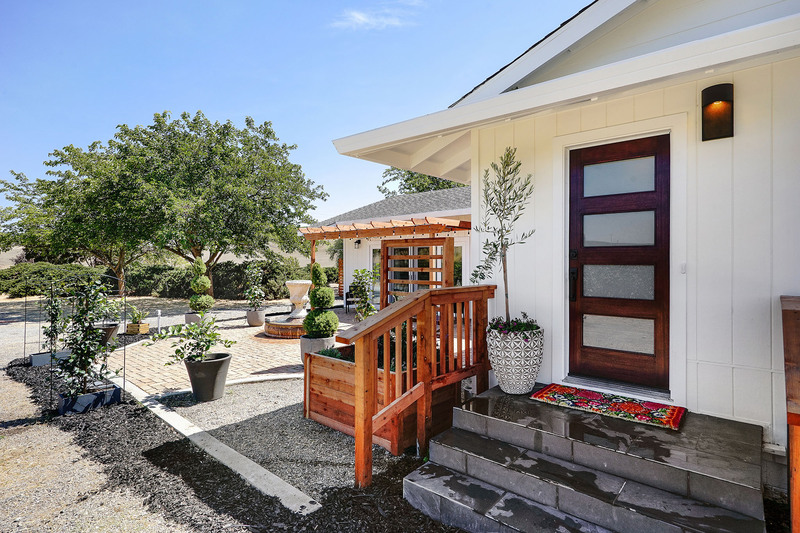 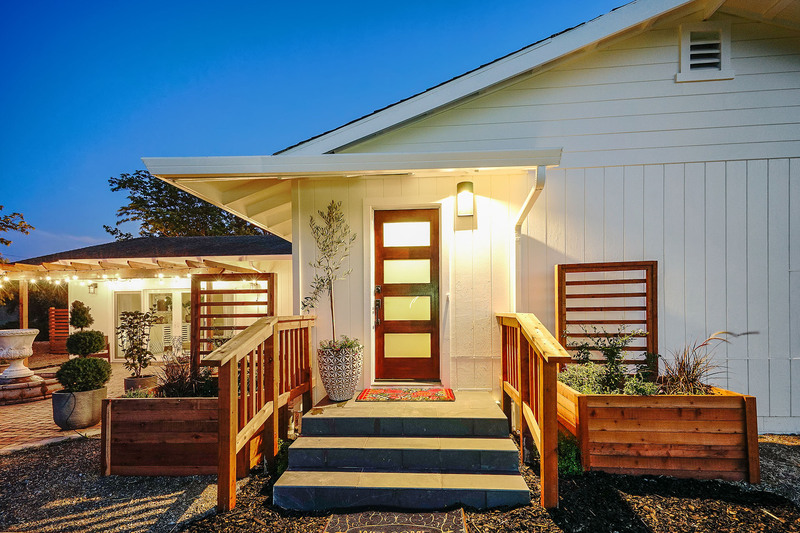 The contemporary front entrance includes grey slate steps that are flanked by two custom planter boxes, and boasts a Mahogany door which opens to the foyer. 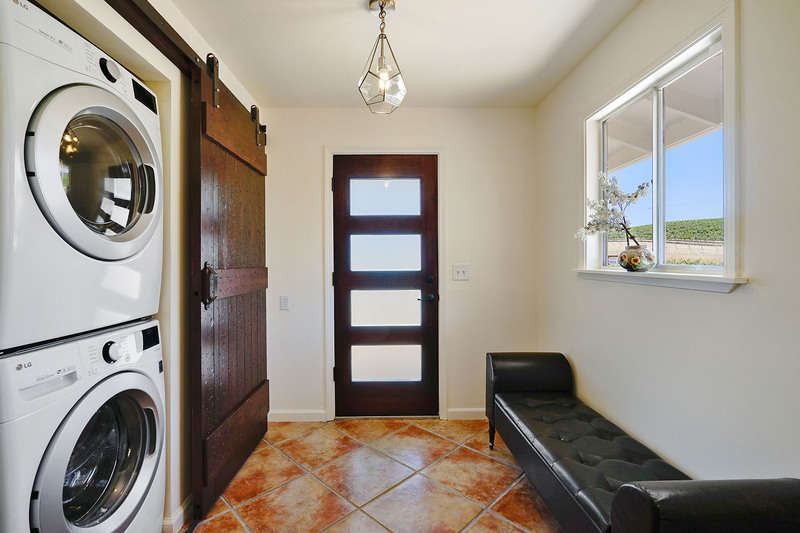 You will be greeted by a modern bronze prism light, rustic barn door, which conceals full size HE stackable LG Washer & Dryer. 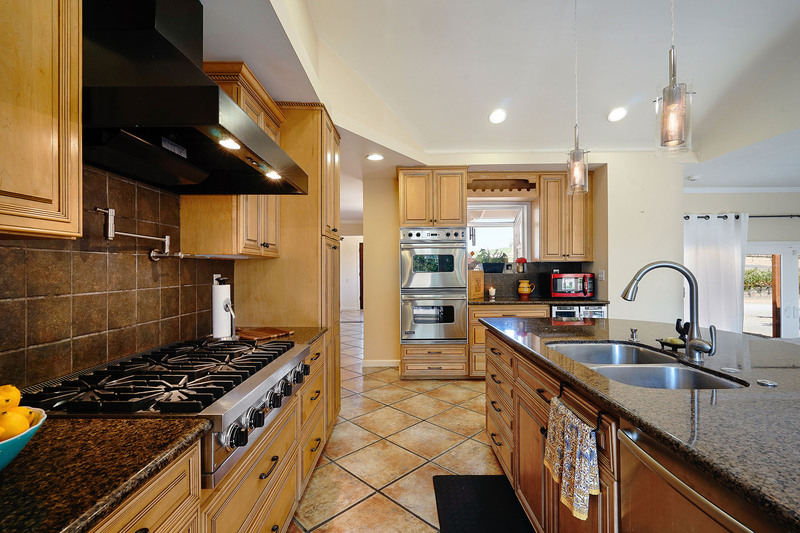 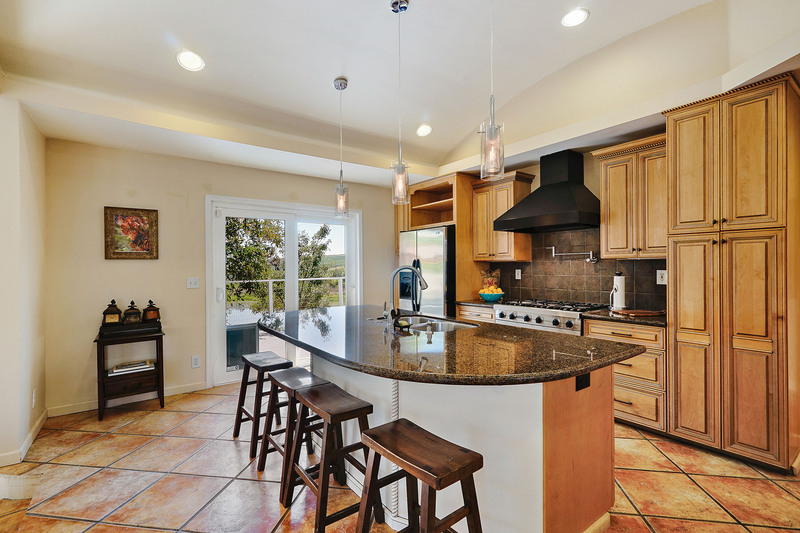 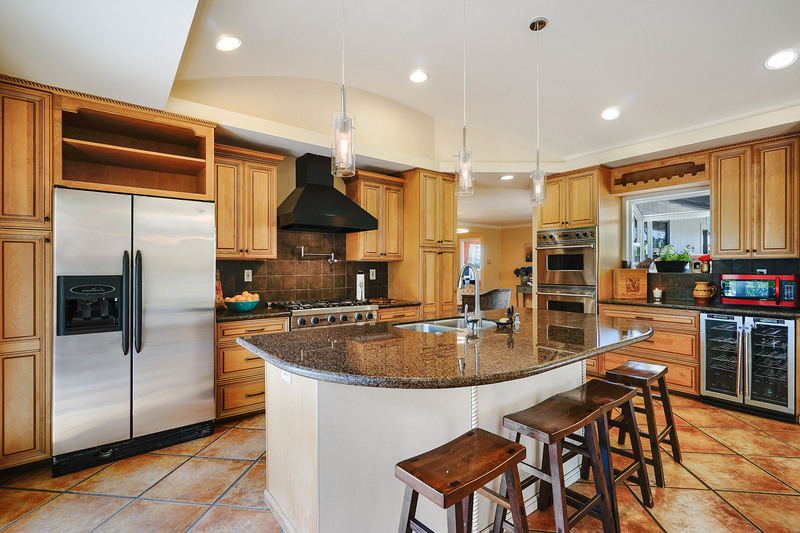 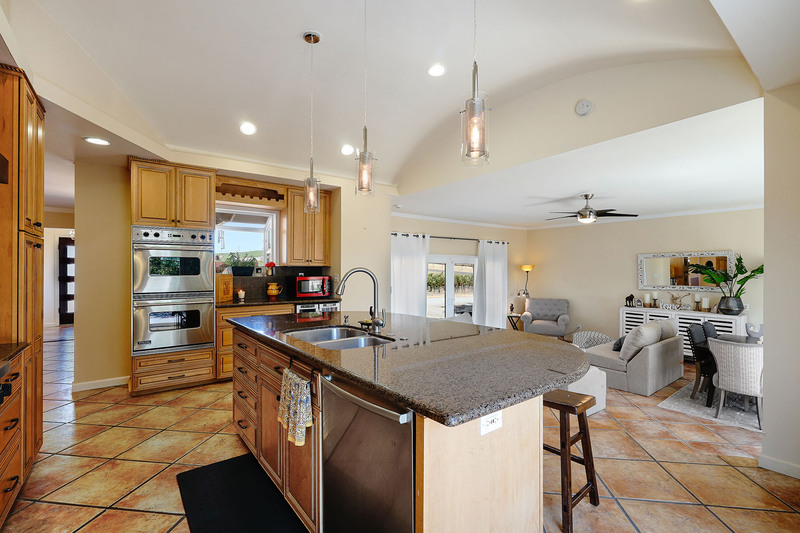 There is a gourmet kitchen with granite countertops, designer cabinets, built-in wine cooler, stainless steel appliances, which includes Viking gas range and hood. 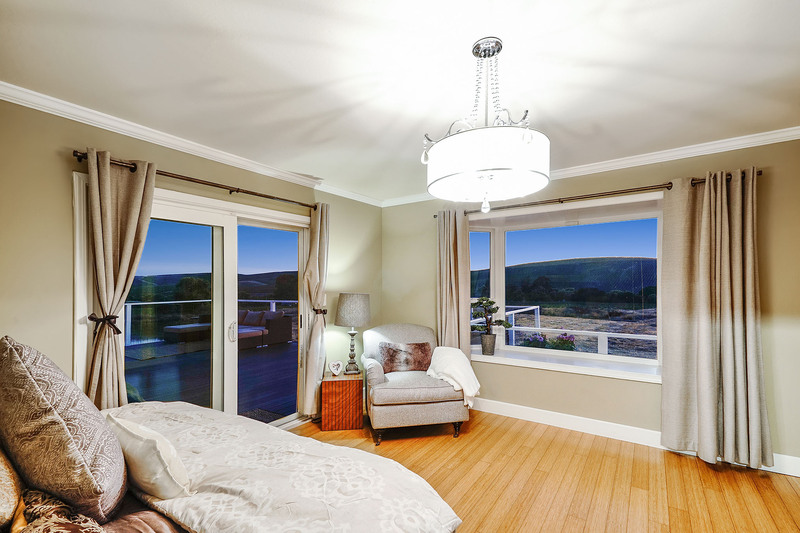 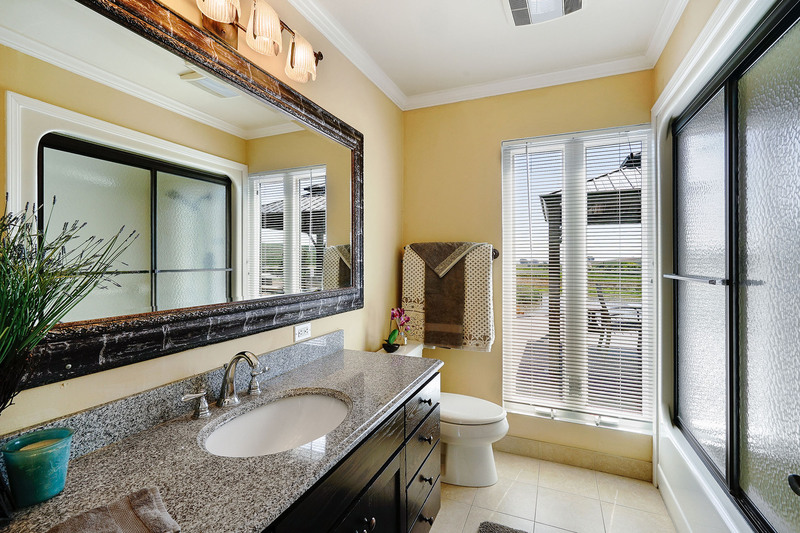 Master Suite boasts panoramic views from every window. 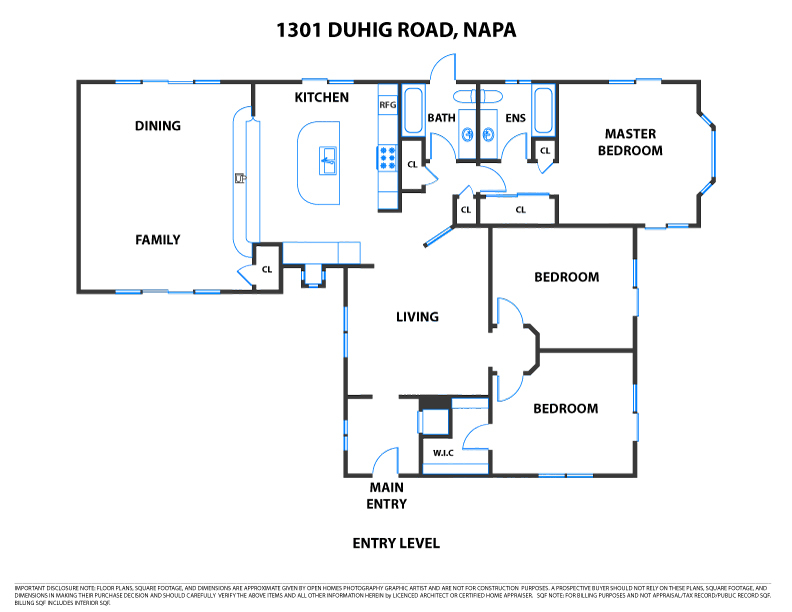 There are also two generous sized bedrooms with access to a shared deck. 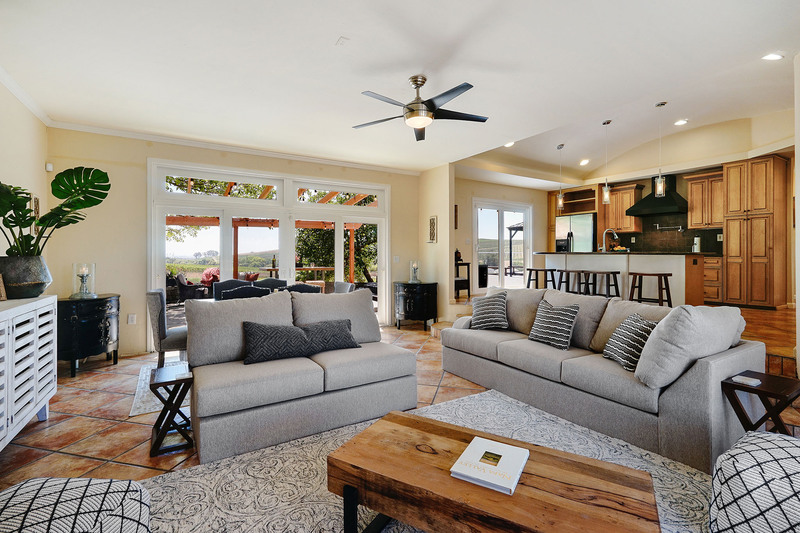 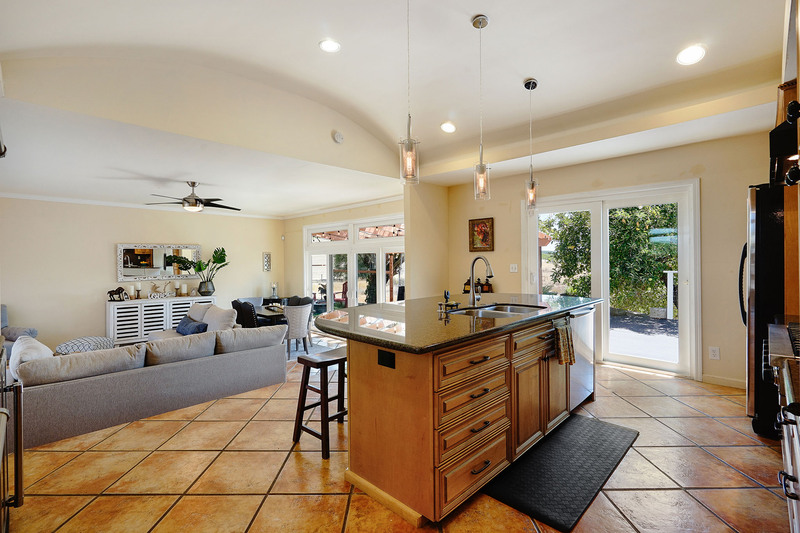 The Great room is perfect for entertaining guests indoor and outdoor living space. 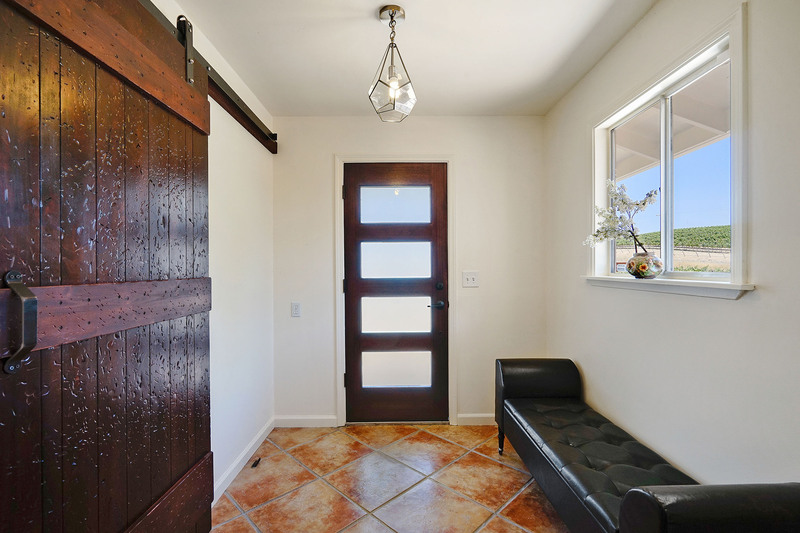 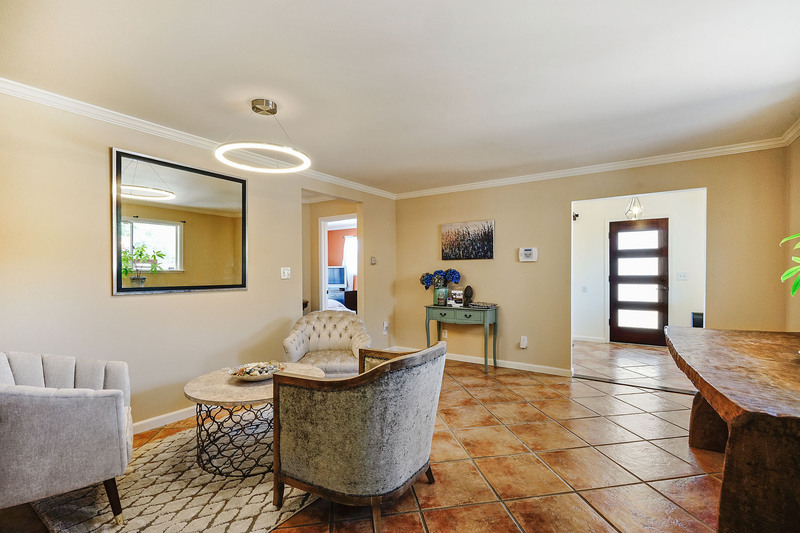 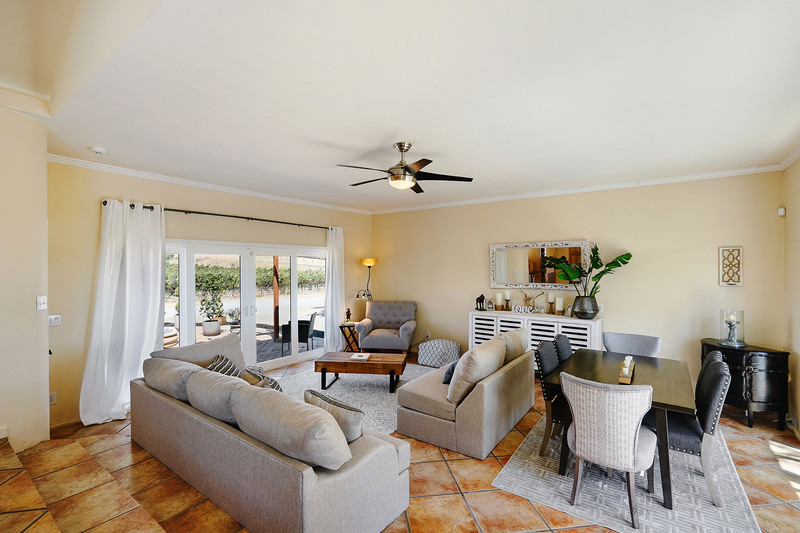 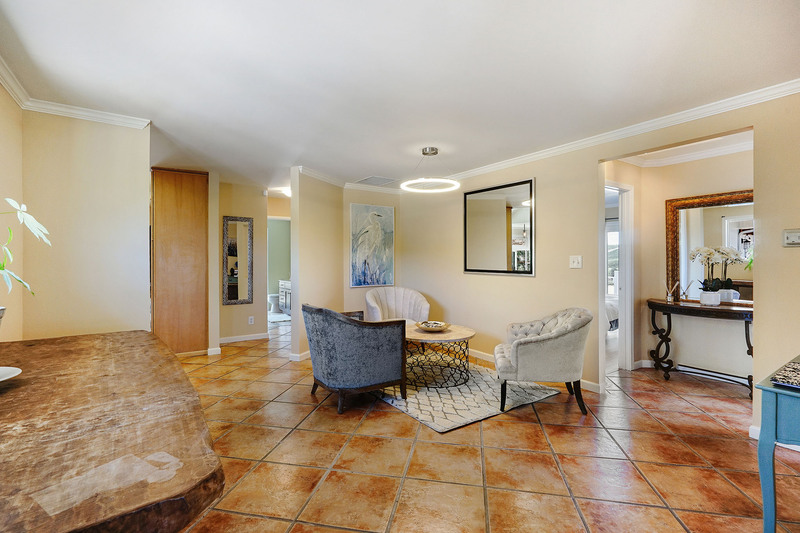 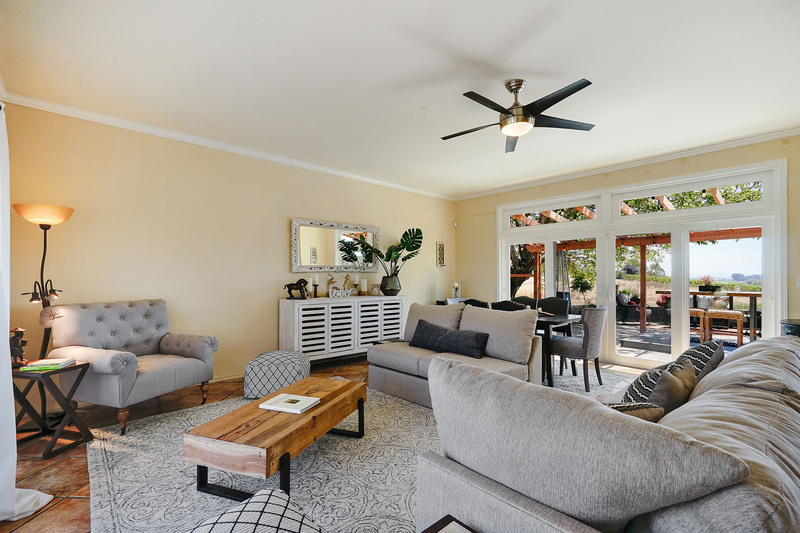 Featuring a living room and dining area, which is open to both the front courtyard and back patio, and can expand to host more guests when you open the patio doors on the left and to the right of the room. 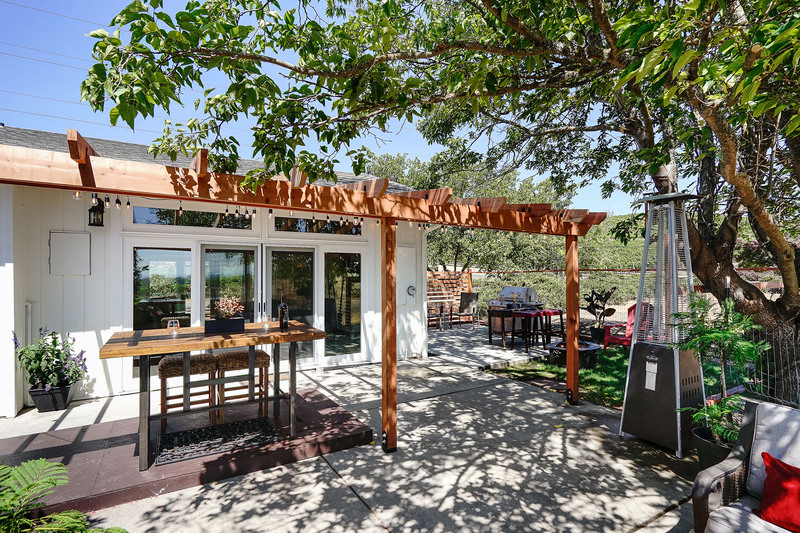 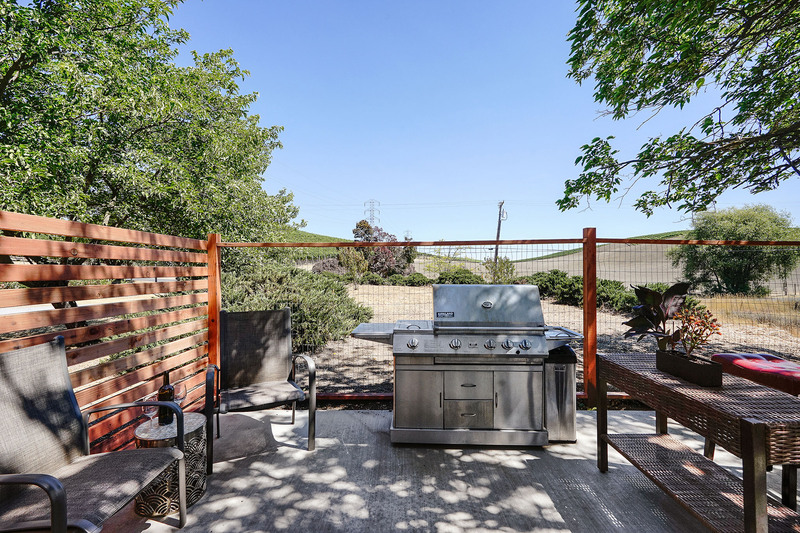 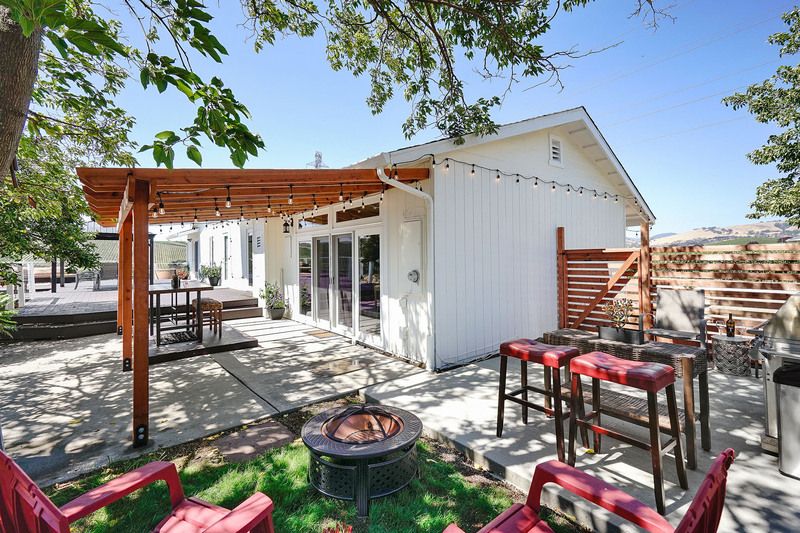 The back yard features a concrete outdoor cooking area with fenced in new lawn, cozy seating that looks out to the natural pond to the bay. 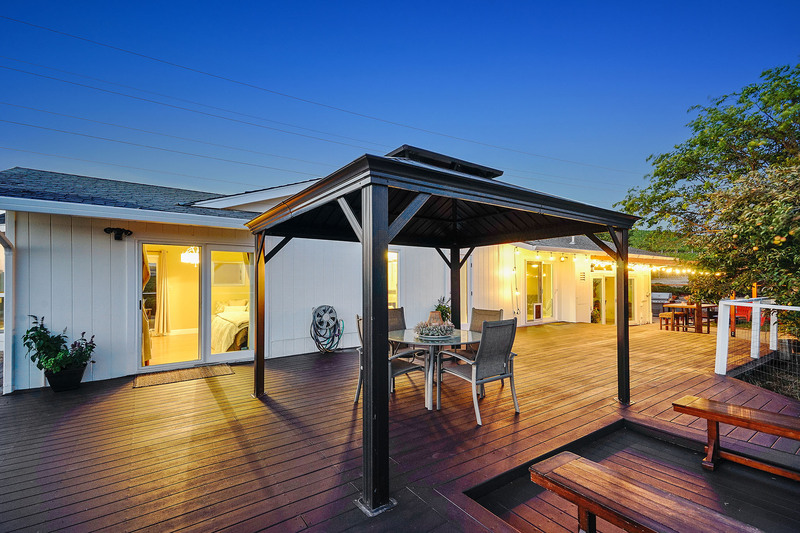 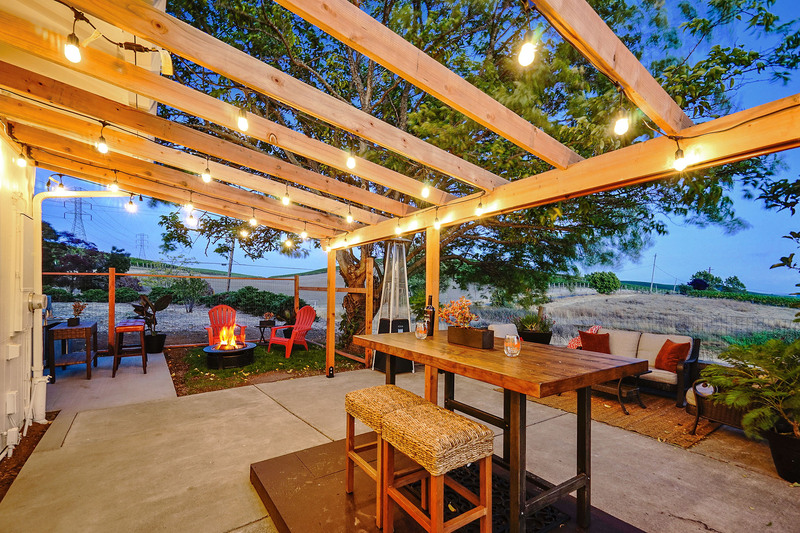 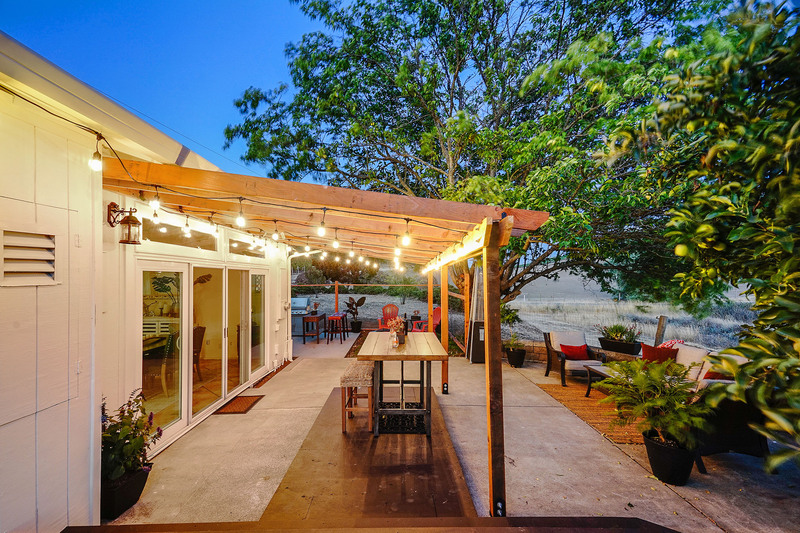 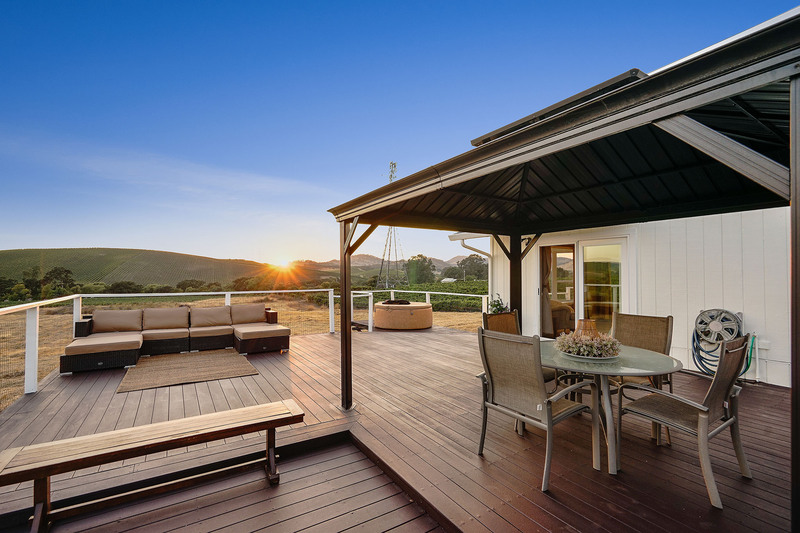 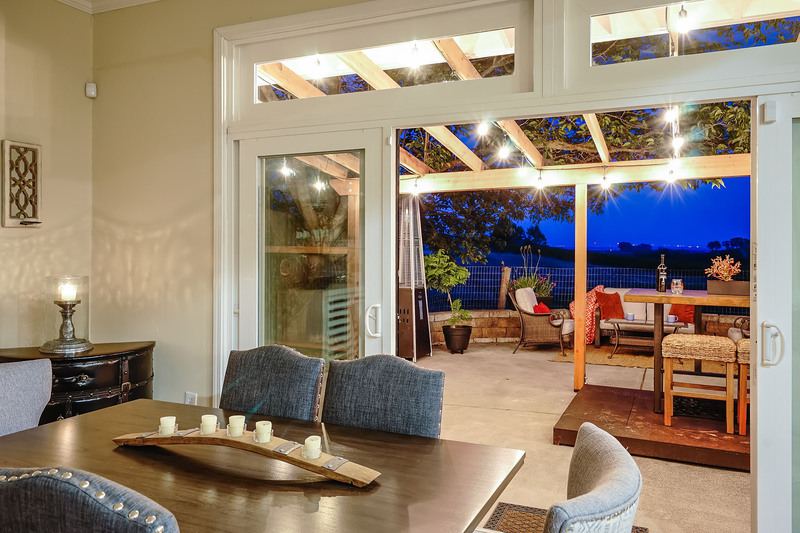 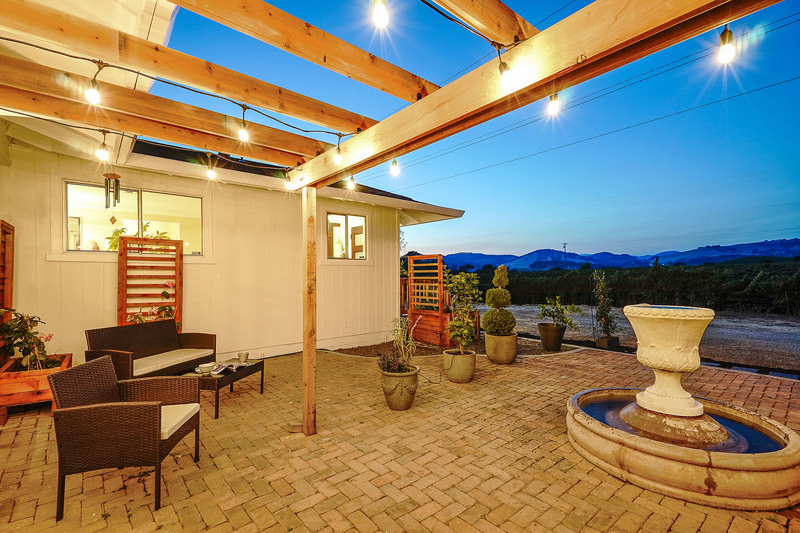 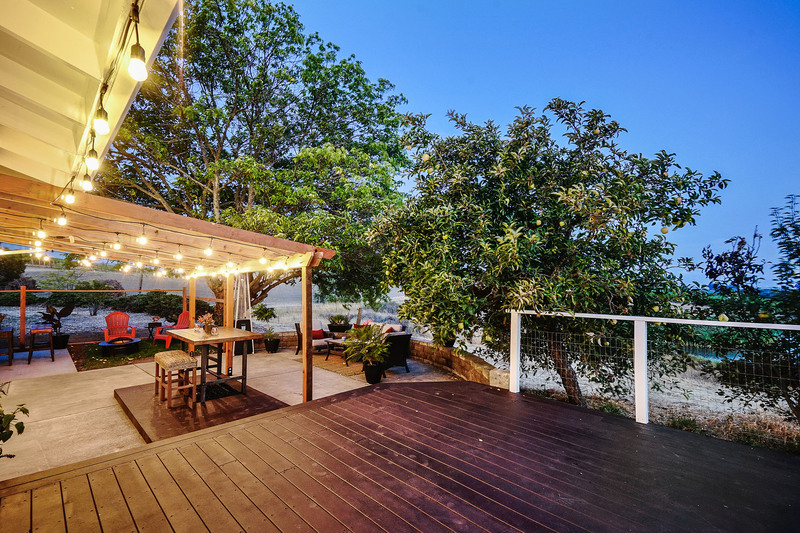 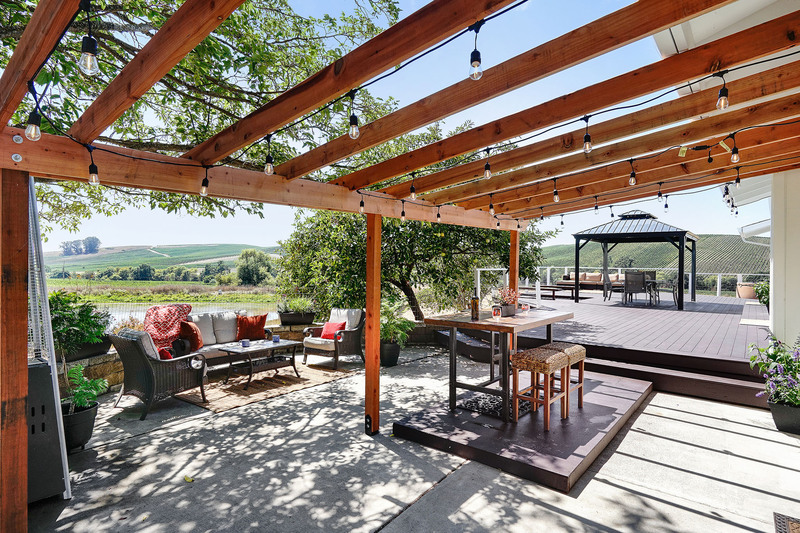 Entertain guests under the pergola, or look out into the wide open spaces on the expansive deck, or relax in the hot tub, or potentially build a pool. 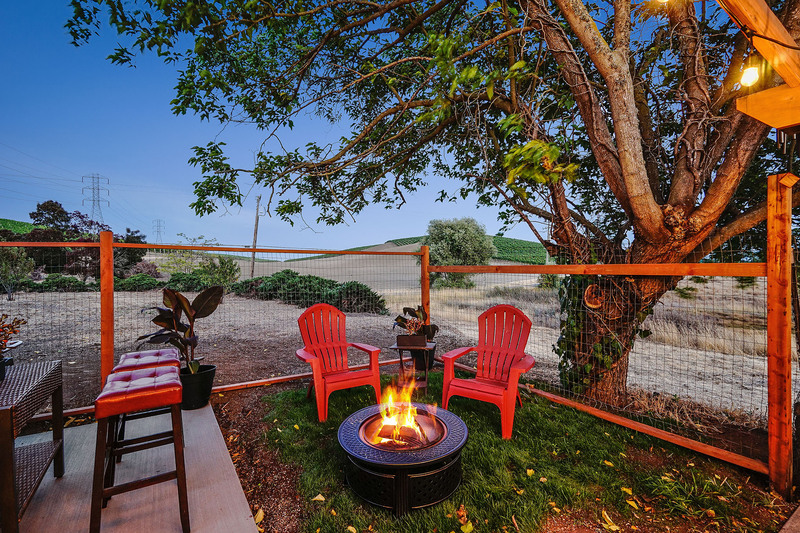 The colorful sunset takes center stage in the evening and dances around the hills before the moon arrives. 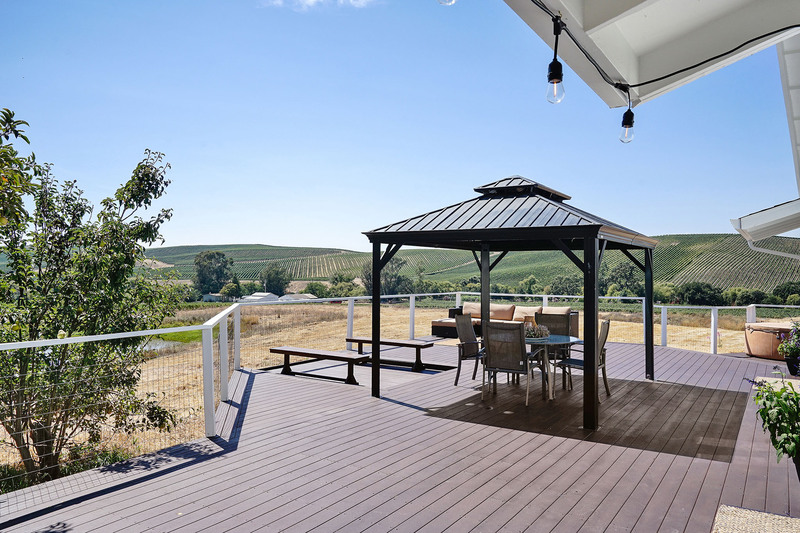 This tranquil setting is nestled between hills and offers hiking trails that wrap around the property to view all off the natural beauty. 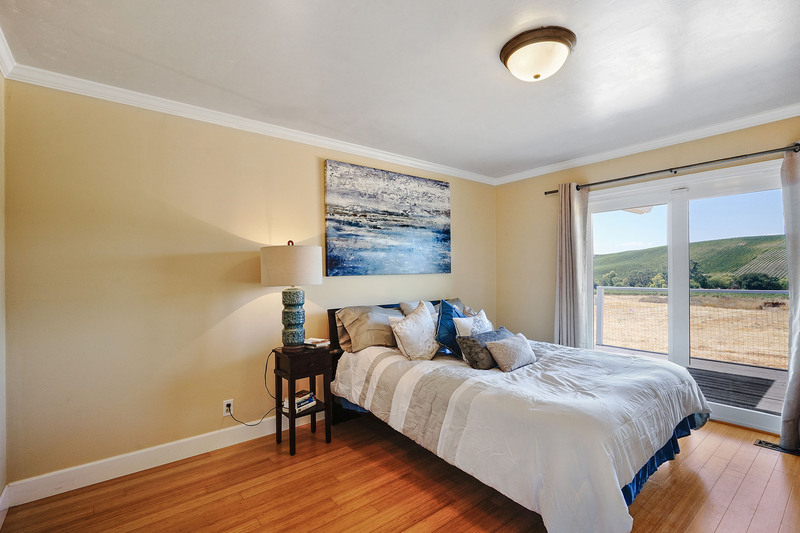 You’ll often be greeted with a light blanket of fog in the early morning, and drifts away to offer a moderate temperature. 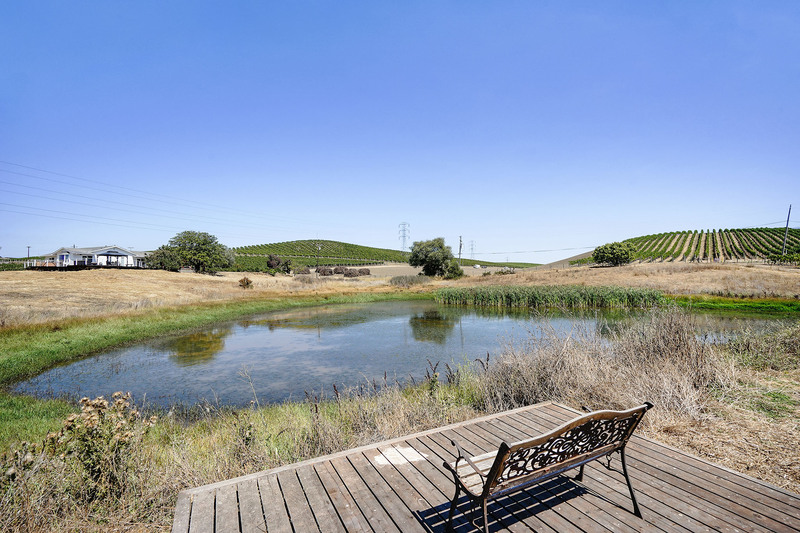 Sit on the observation deck at the pond to see many of the birds that flock to the area. 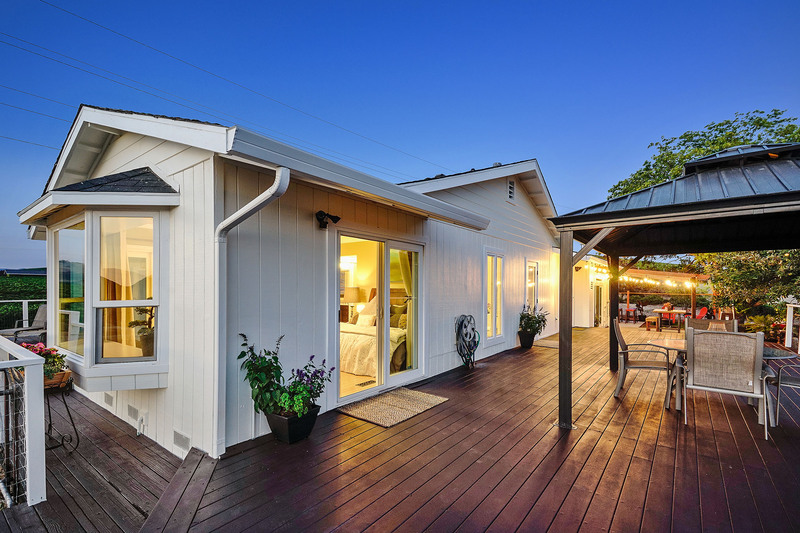 Bring your imagination to further develop the property. 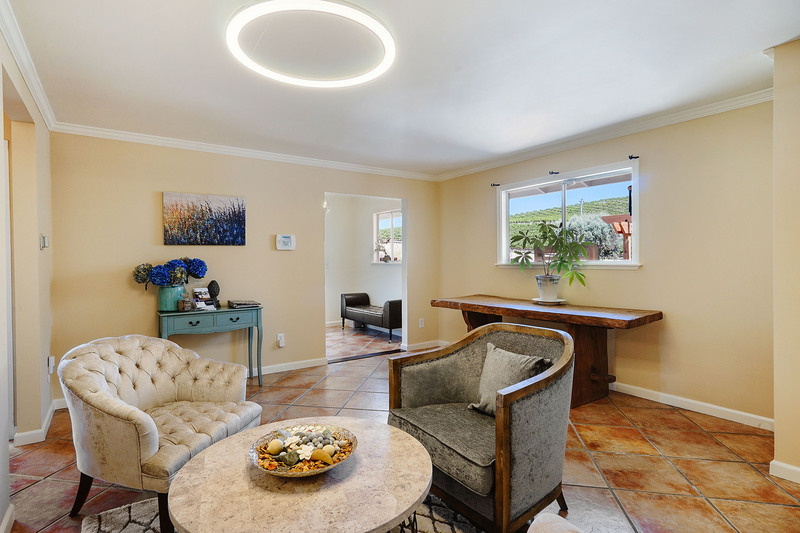 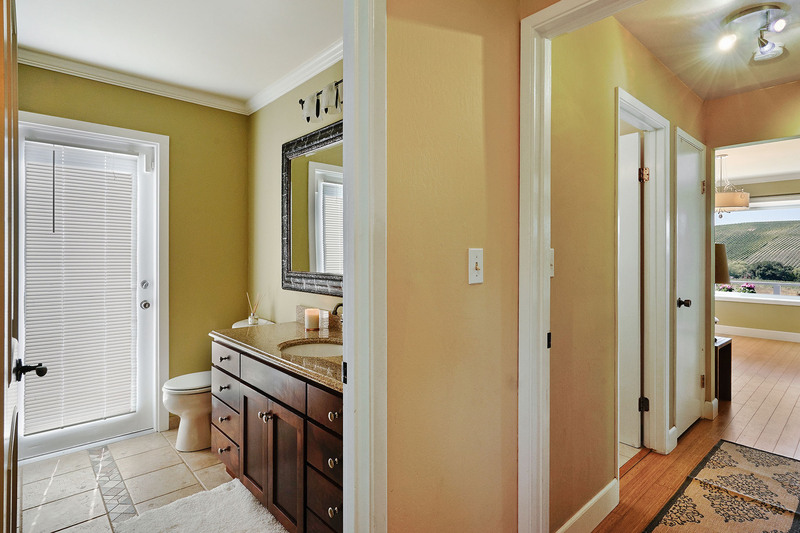 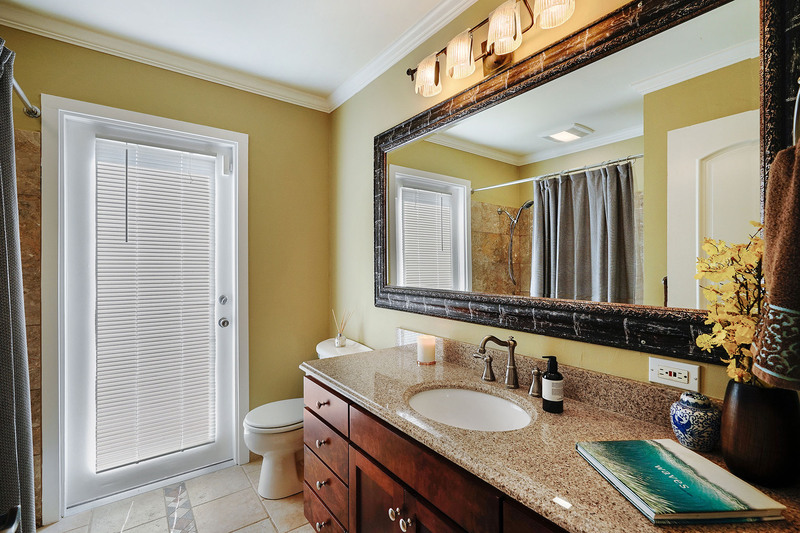 Contact to schedule an appointment to view today. 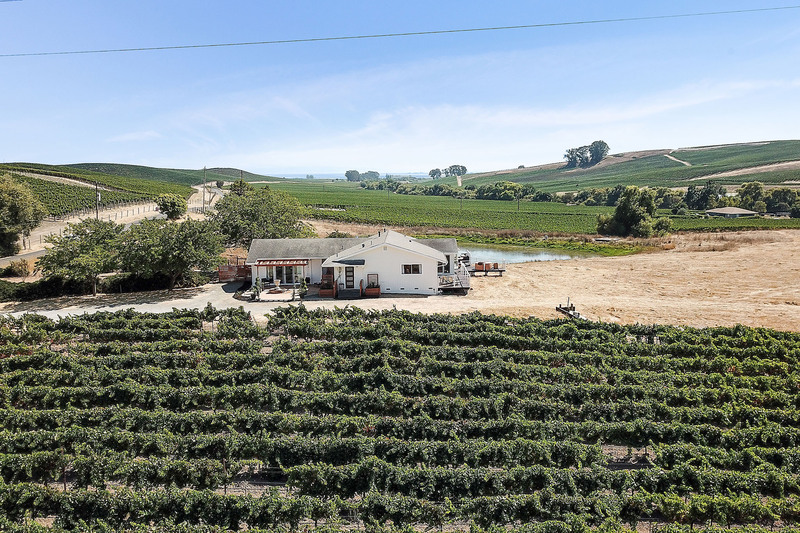 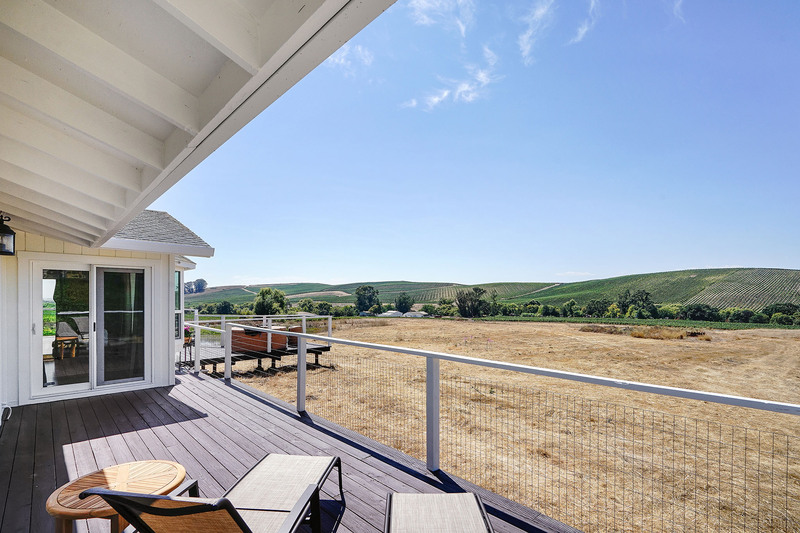 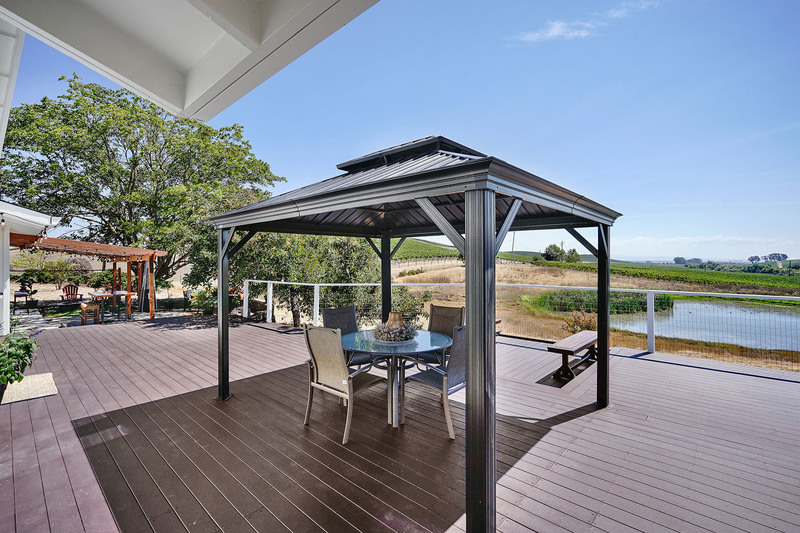 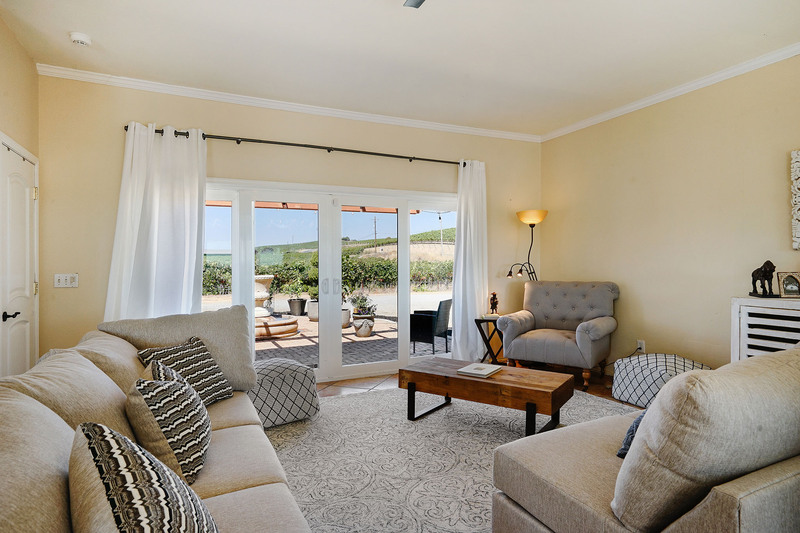 The property is situated in the Los Carneros AVA (also known as Carneros AVA) is an American Viticultural Area which includes parts of both Sonoma and Napa counties in California, U.S.A.. 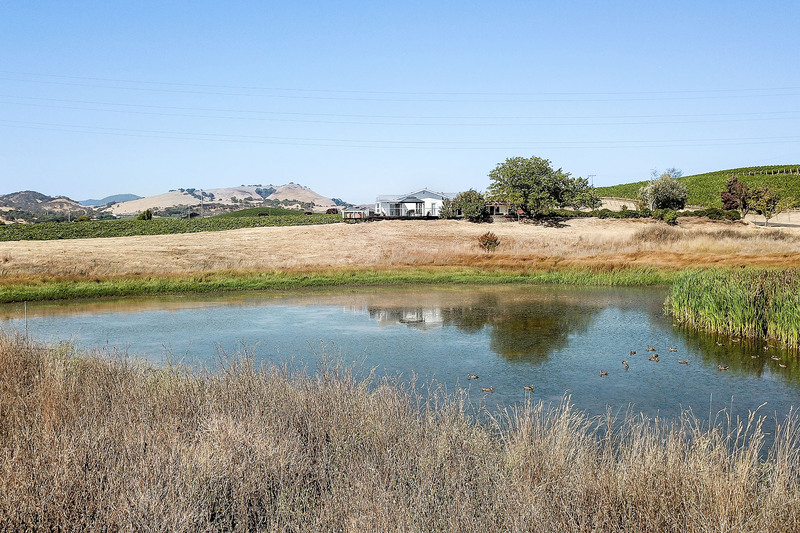 It is located north of San Pablo Bay. 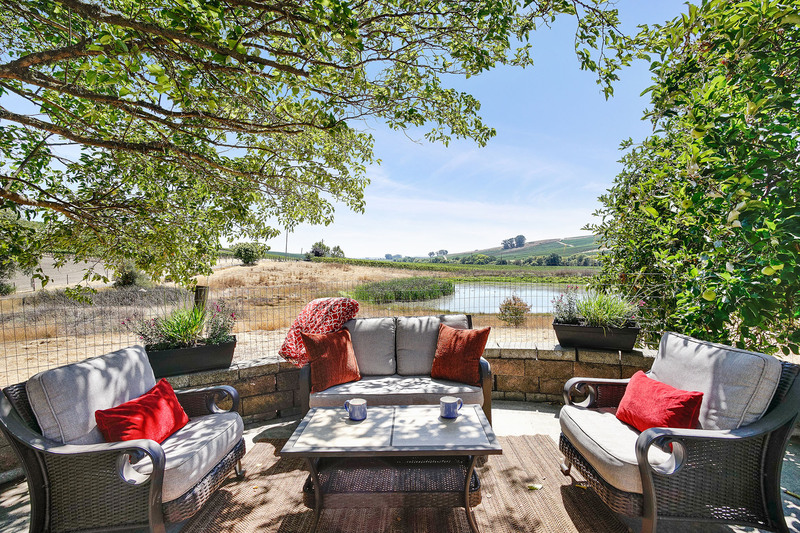 The proximity to the cool fog and breezes from the bay makes the climate in Los Carneros cooler and more moderate than the wine regions further north in Napa Valley and Sonoma Valley. 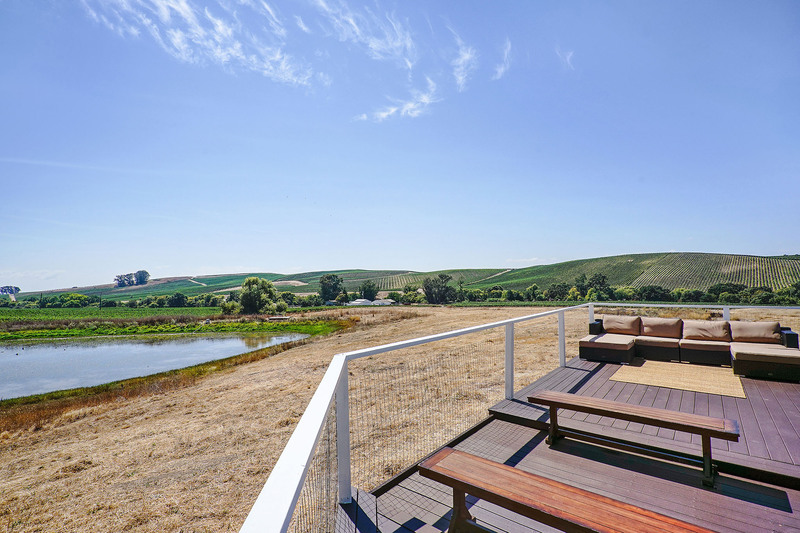 The cooler climate has made Los Carneros attractive for the cultivation of cooler climate varietals like Pinot noir and Chardonnay. 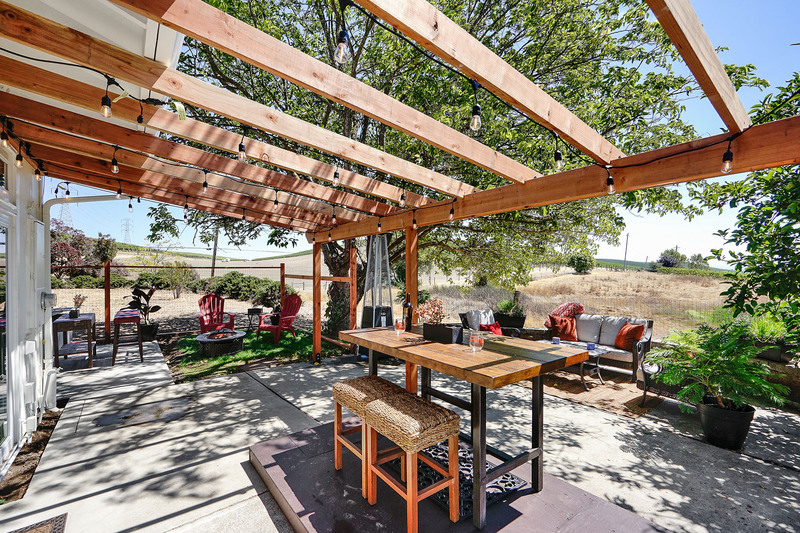 Many of the grapes grown in Los Carneros are used for sparkling wine production. 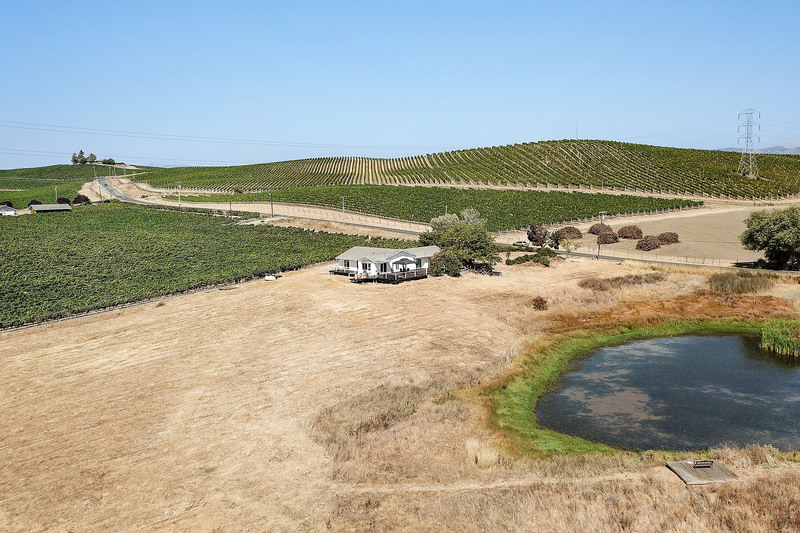 Receiving its AVA status in 1983, the Carneros area was the first wine region in California to be defined by its climate characteristics rather than political boundaries. 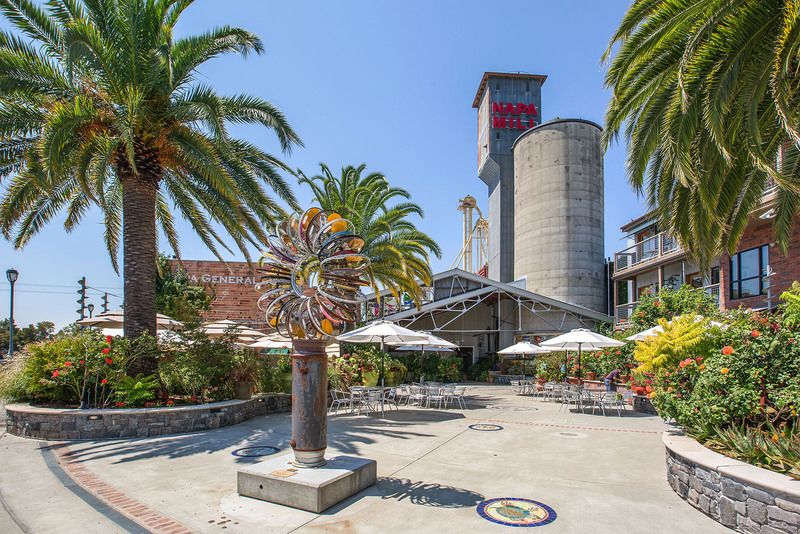 There is also more to the city and county of Napa, than great wine. 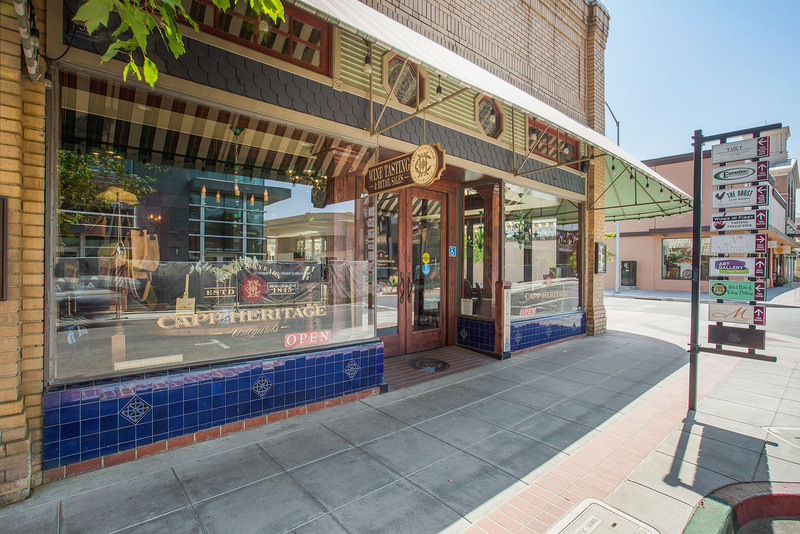 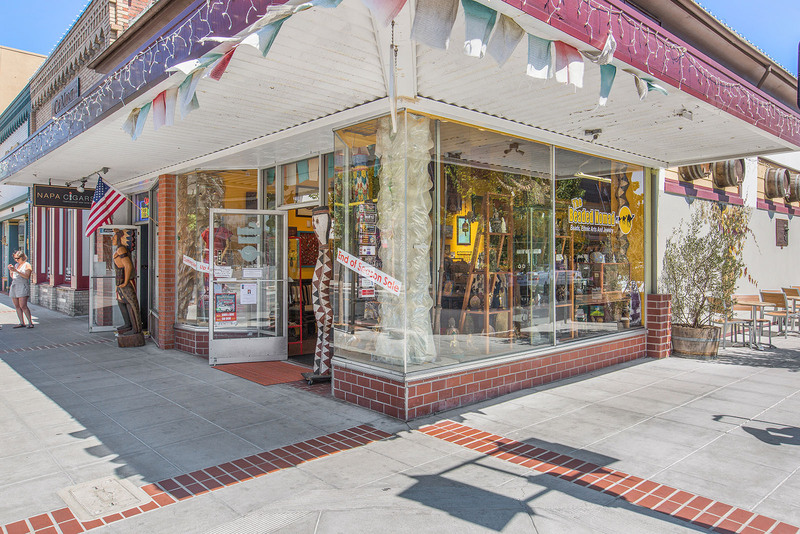 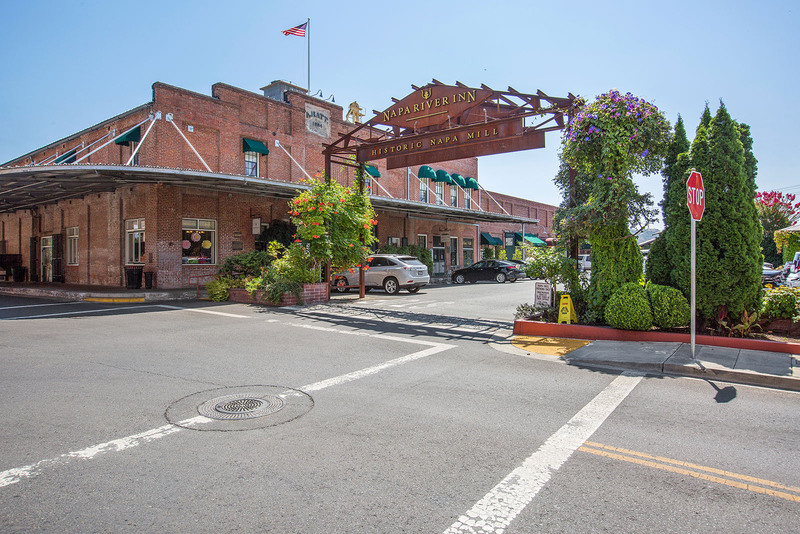 Old Town Napa features charming cottages, bungalows, Victorians, and Queen Anne homes. 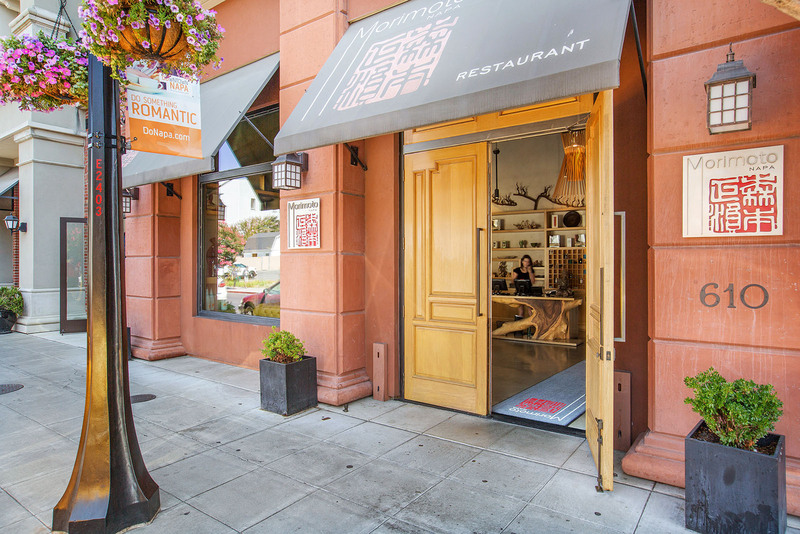 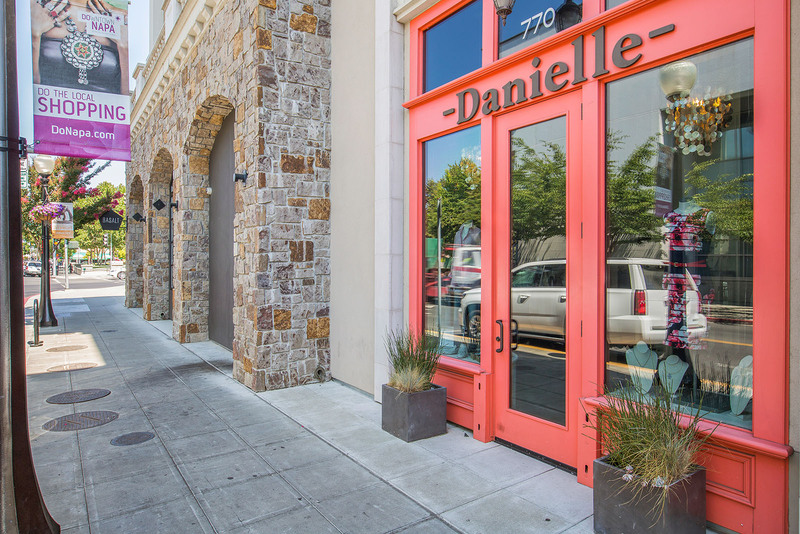 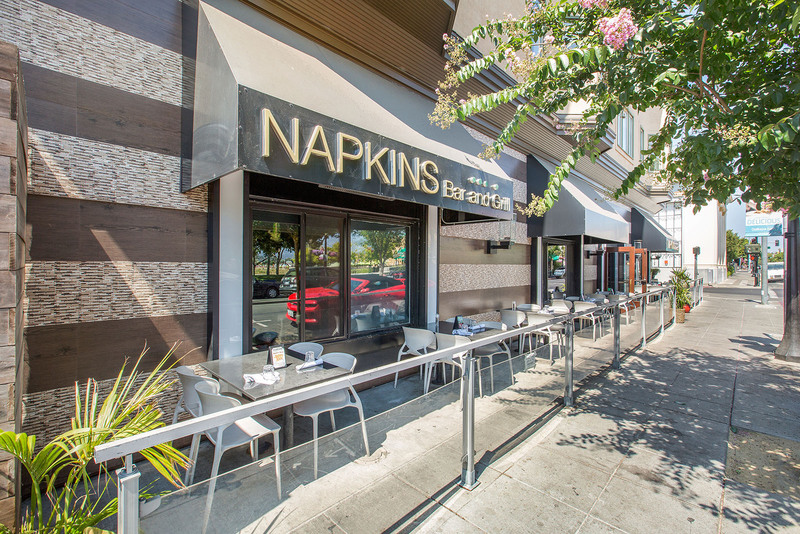 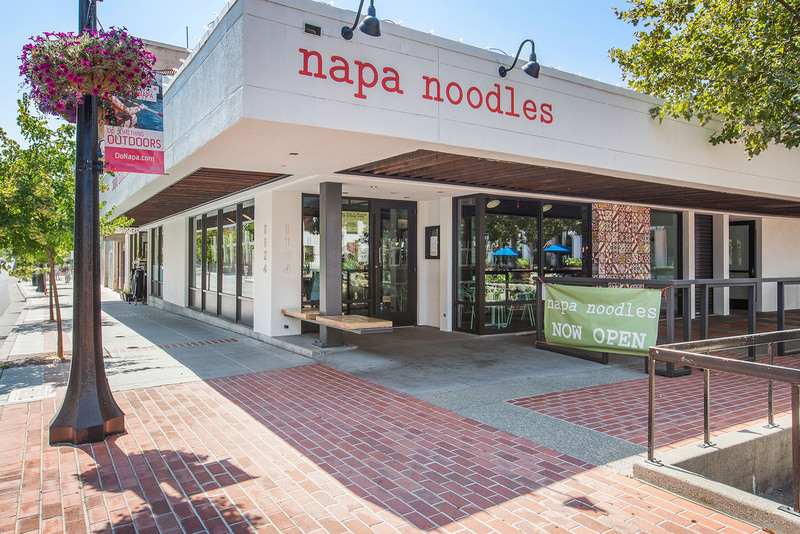 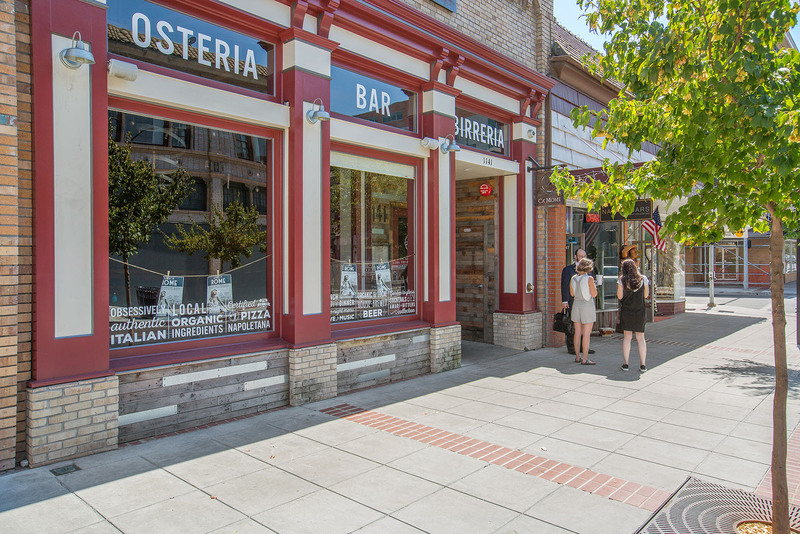 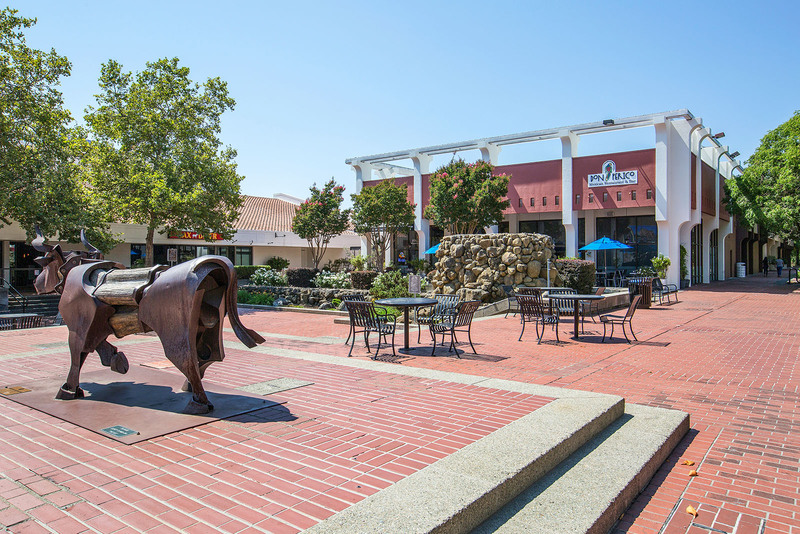 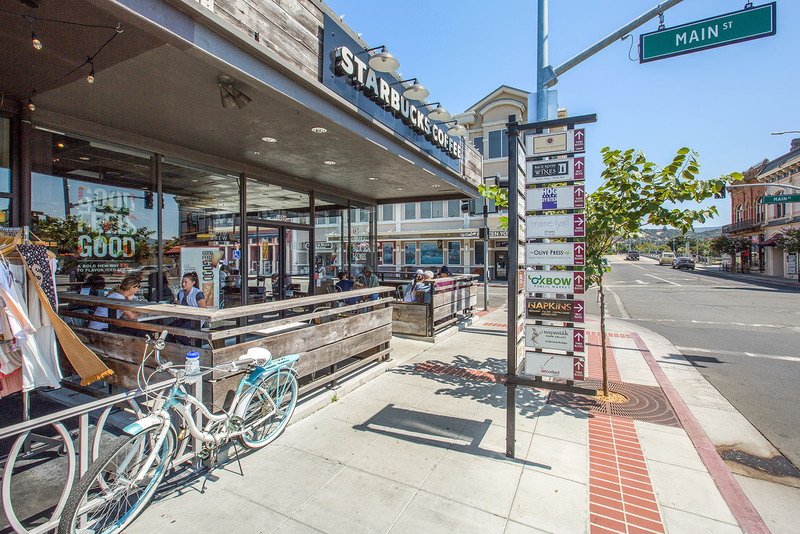 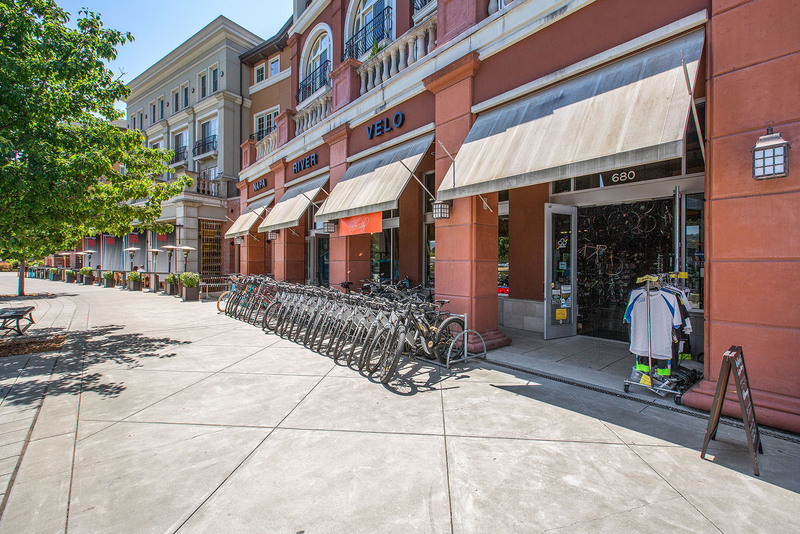 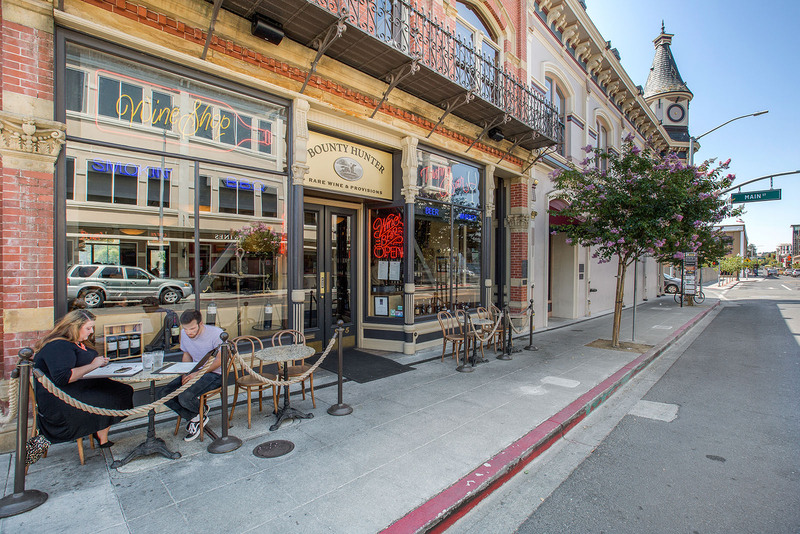 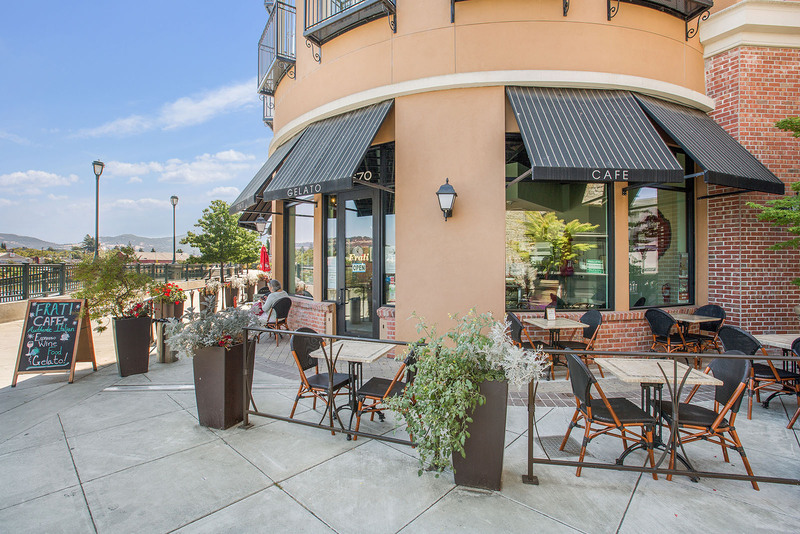 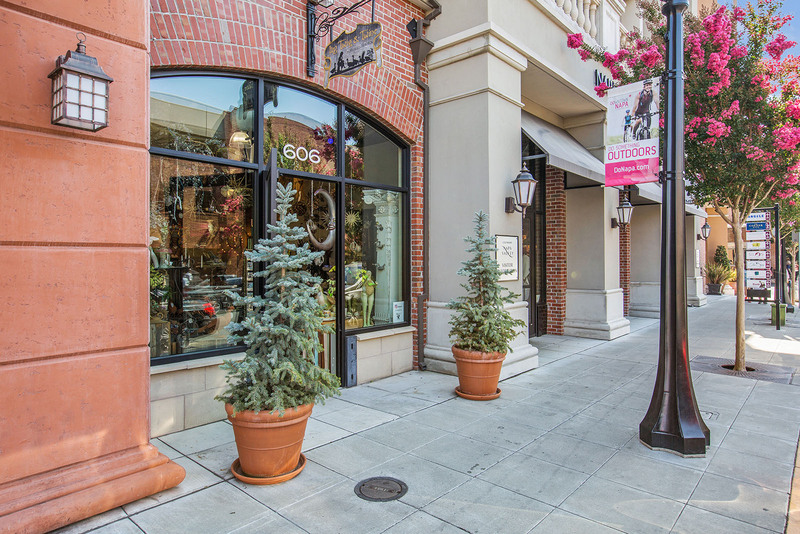 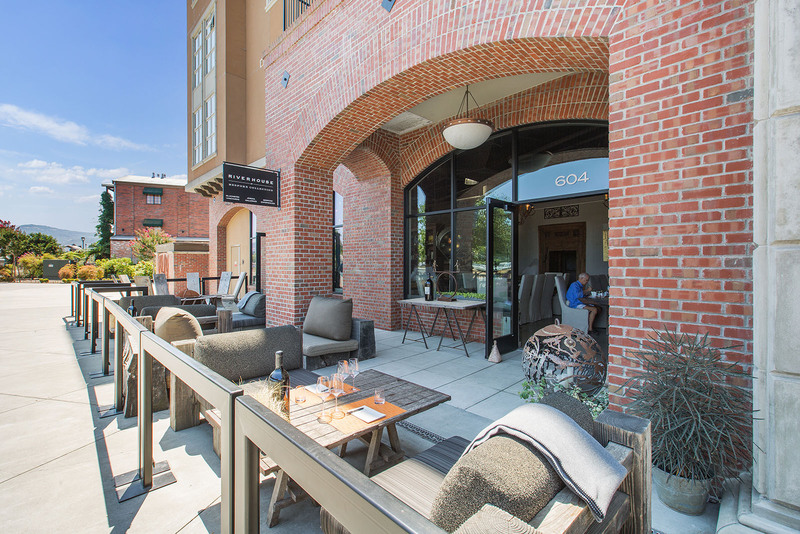 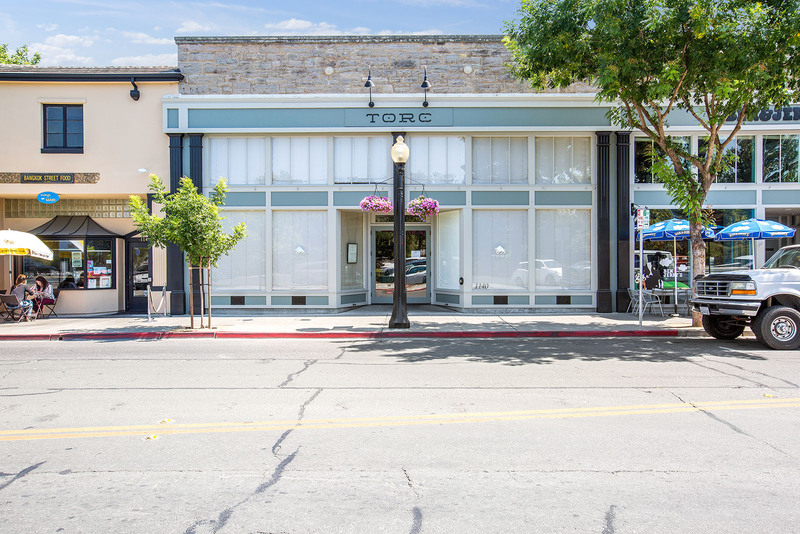 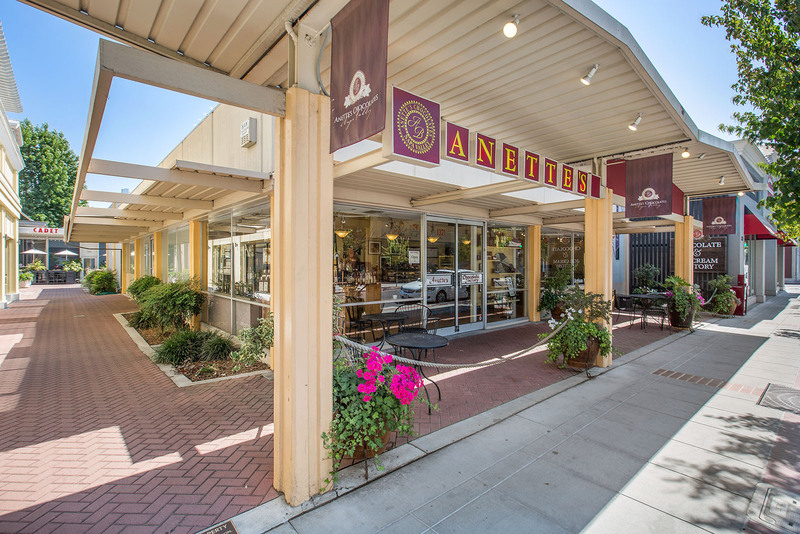 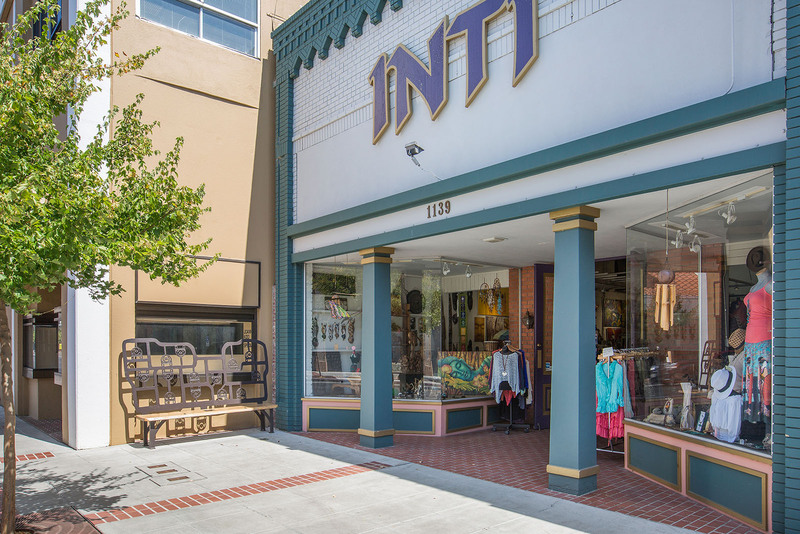 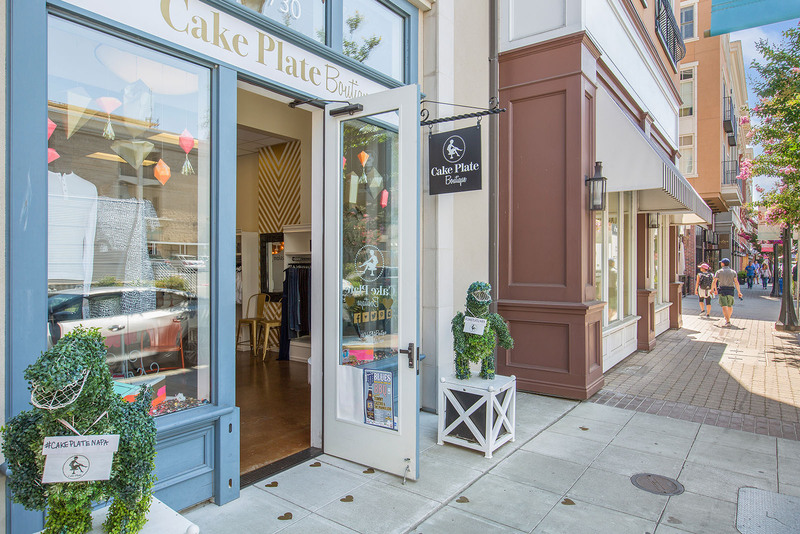 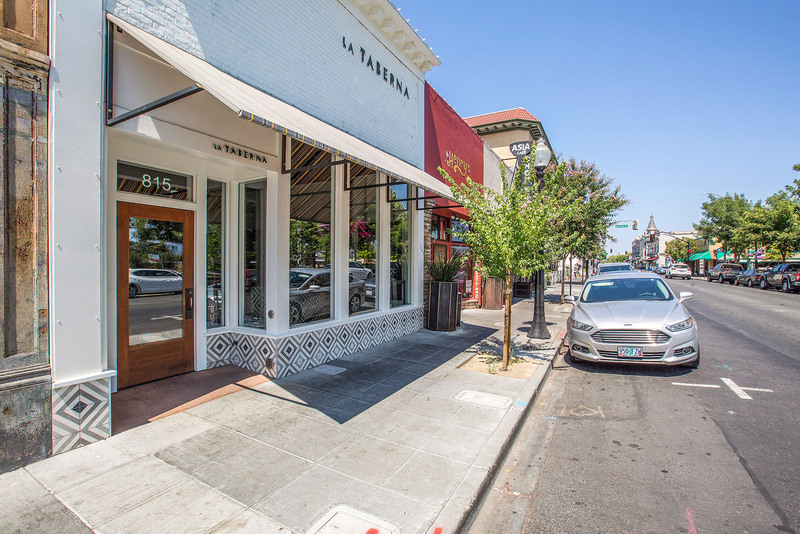 Downtown Napa offers phenomenal restaurants, farmers’ markets, boutique shopping, and plenty of wine-tasting rooms. 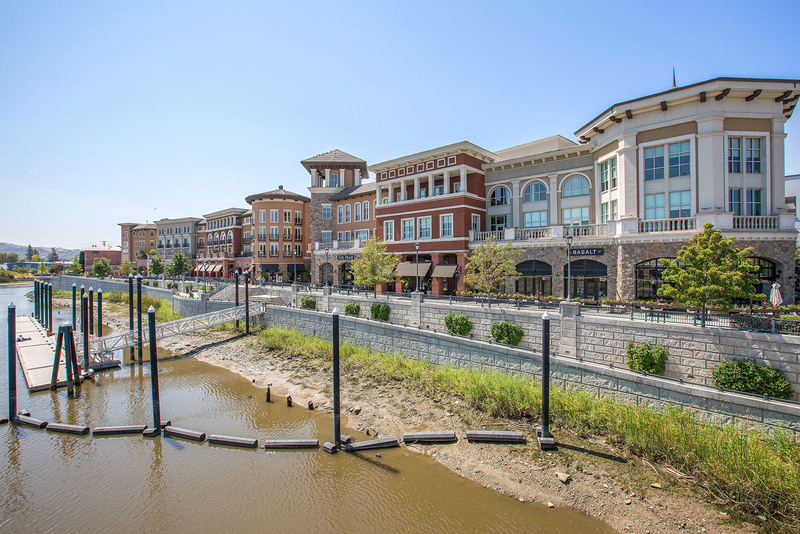 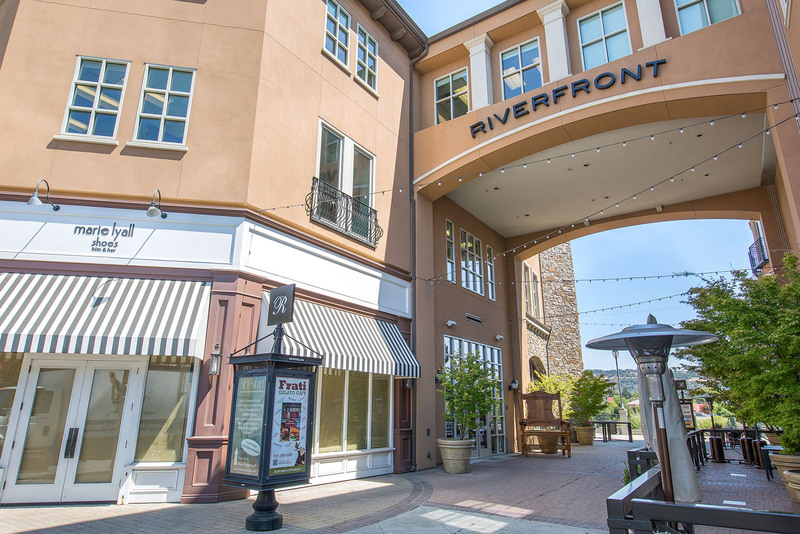 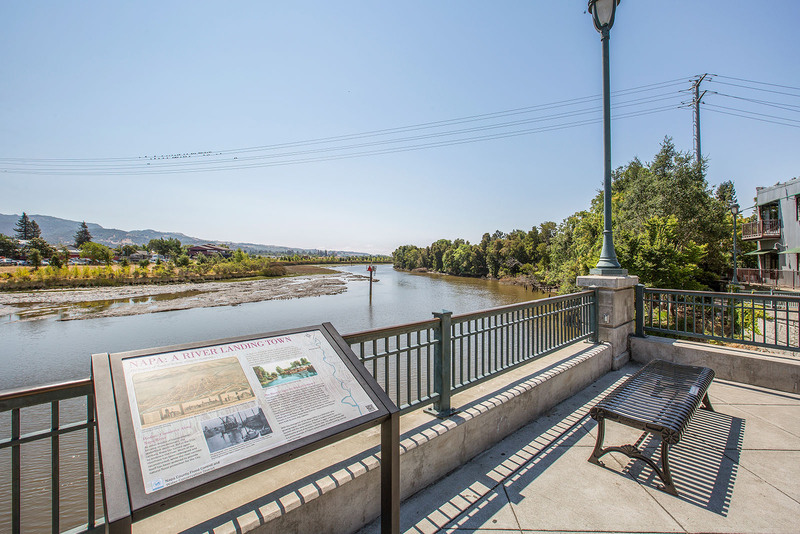 The development of the riverfront, along with a riverbank promenade, signaled the renaissance of Napa’s downtown. 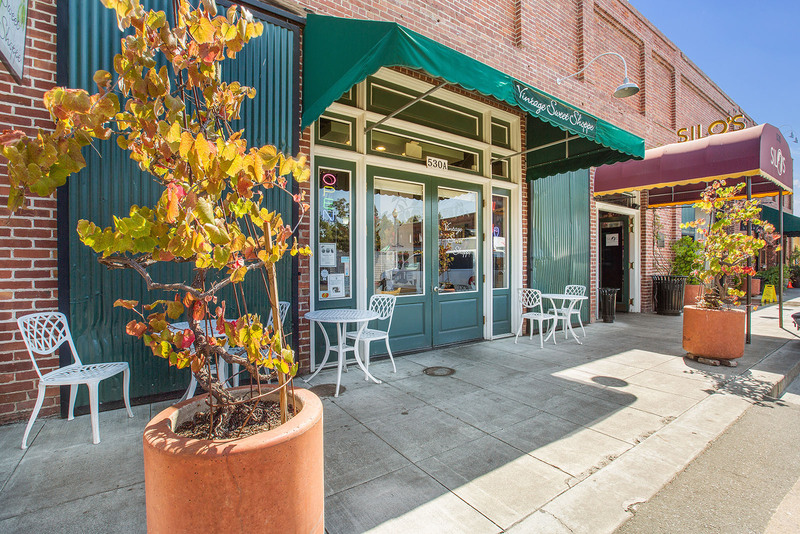 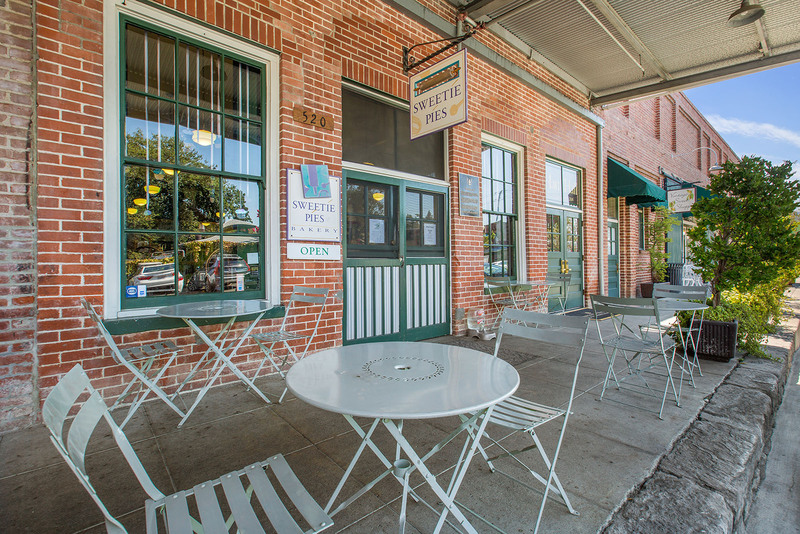 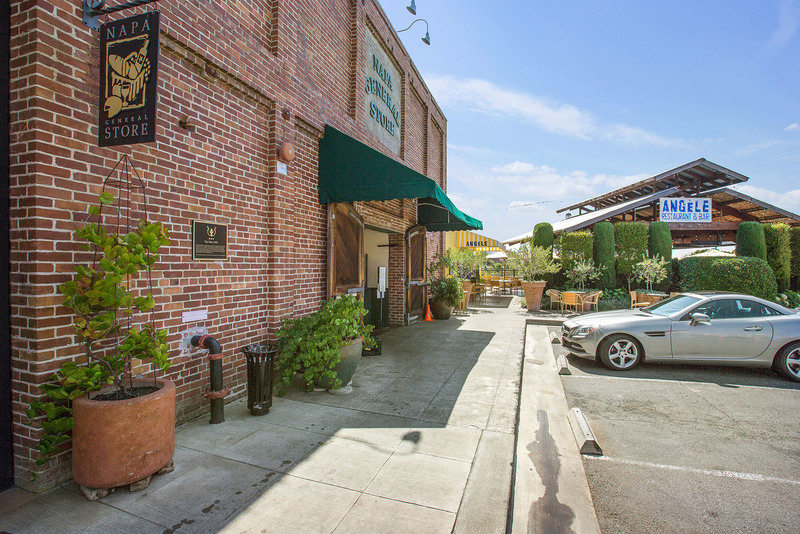 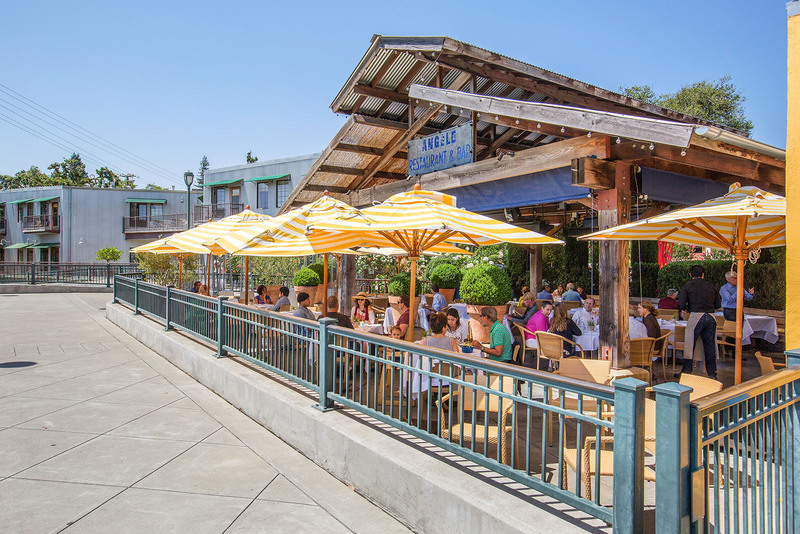 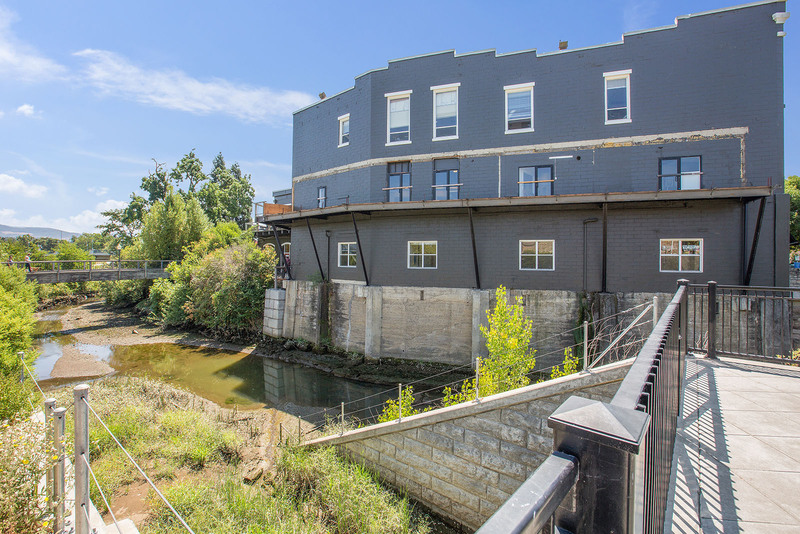 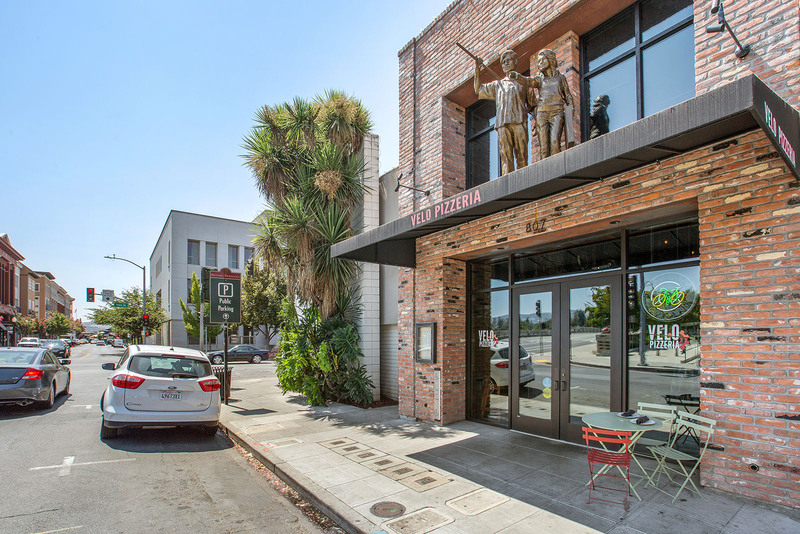 Where the Napa River makes a bend through the city, you’ll find Oxbow Public Market in downtown Napa’s Oxbow District. 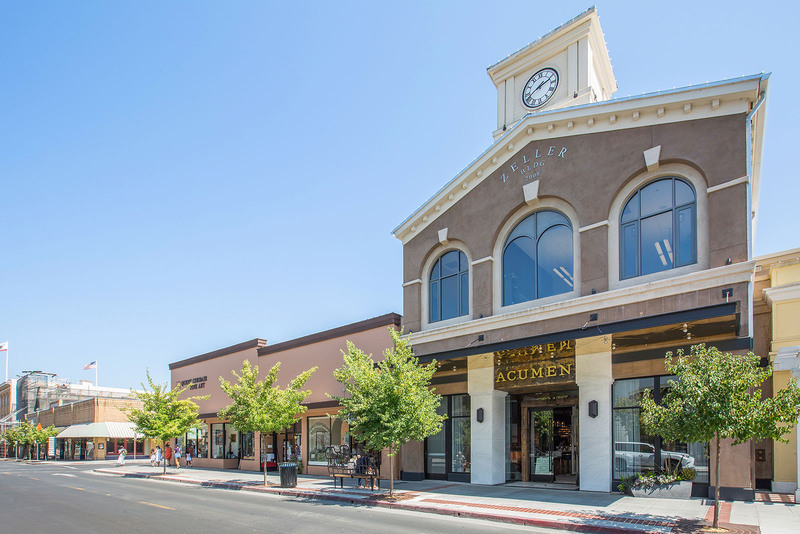 Every Tuesday night, the merchants celebrate Local’s Night, sponsoring live music, wine tastings, and face painting for kids. 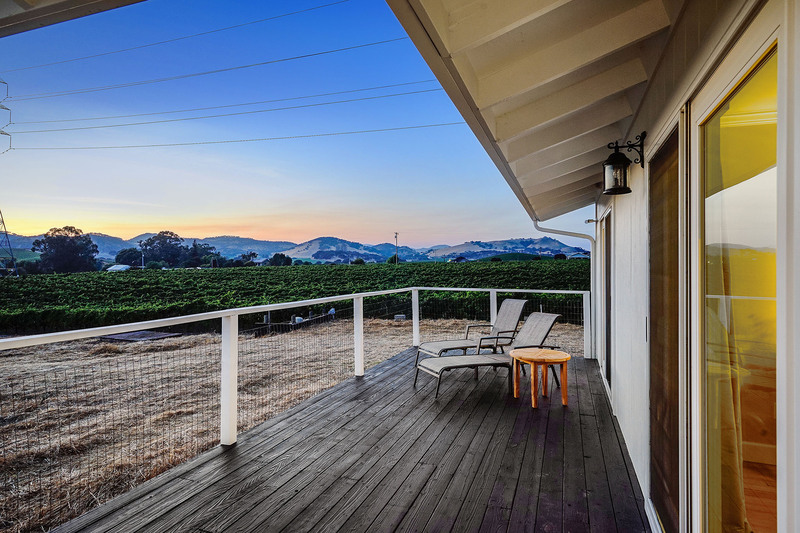 Venture a few miles outside of the city and you will be in farm country, surrounded by vineyards and horse stables. 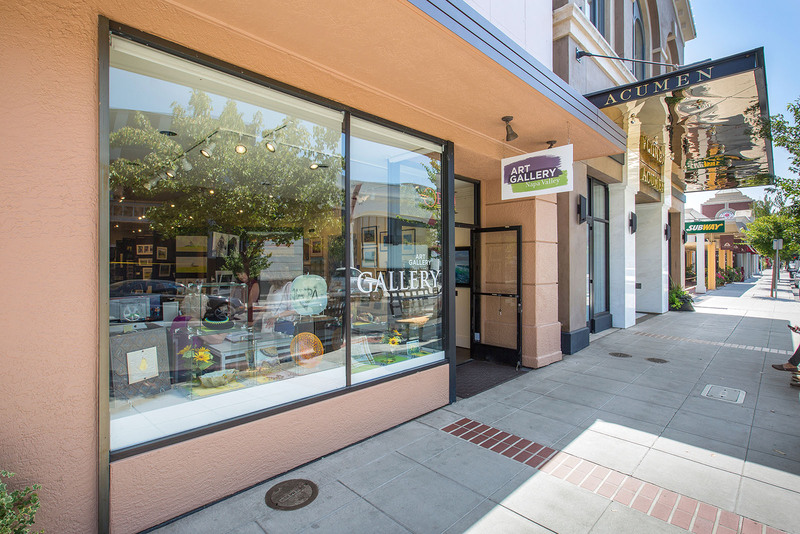 On Redwood Road, The Hess Collection includes a gallery of museum-quality modern art featuring works by Robert Motherwell, Anselm Keifer, and Leopoldo Maler.